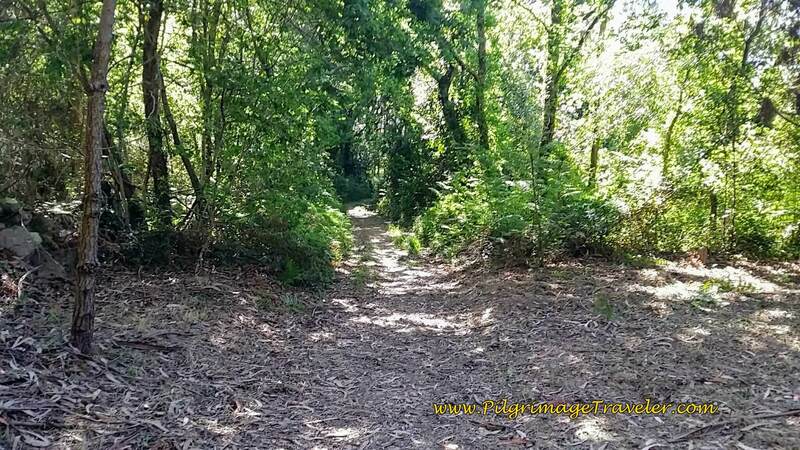 Our day seventeen on the Camino Portugués had no practical Senda Litoral route, but instead we turned inland onto the historical Coastal Route. Plus the day had started out windy and cool, another reason to stay inland. I did not relish the idea of wind and rain blowing on me from the sea. 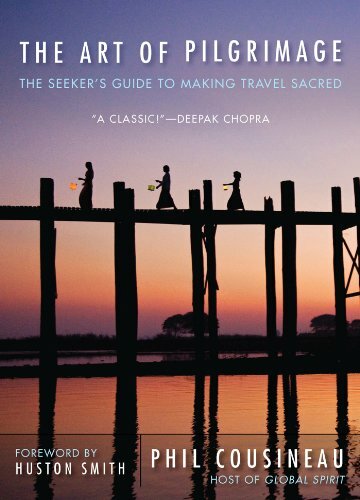 I love this quote, because, when stripped bare, most folks are traveling on the Camino for this very reason ~ escape from ordinary life. 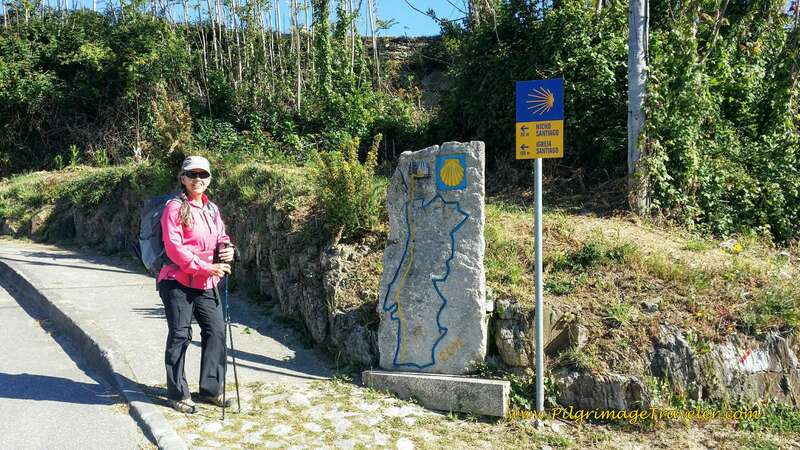 On day seventeen of our Camino Portugués, we had the same goals, as well as meeting many a pilgrim, with whom having only a few weeks respite from work, were spending it on the Camino. Here are my geotracks from day seventeen. I have placed the places we stopped, and some significant other places we passed right along the Way. For a complete list of accommodations, click here. 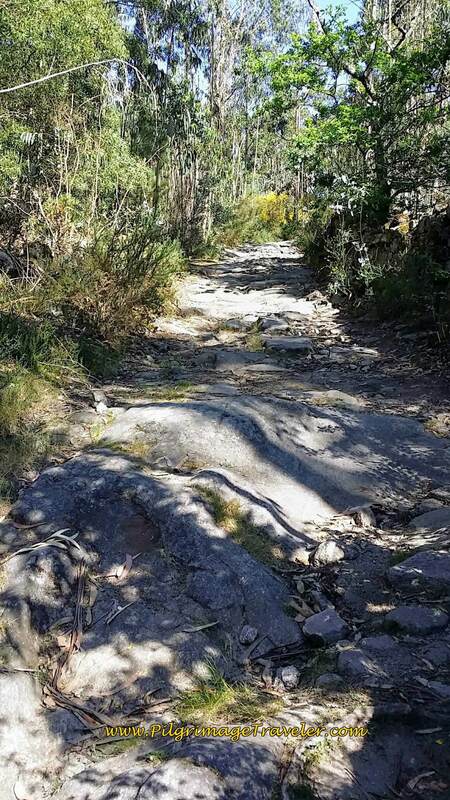 The route was predominantly on coastal hills, as you can see. Several of them were quite significant, leading to lots of terrain variation for the day. However, nothing was truly difficult for the average walker. We awoke to what I called in my voice journal, a "pilgrim's tragedy!" 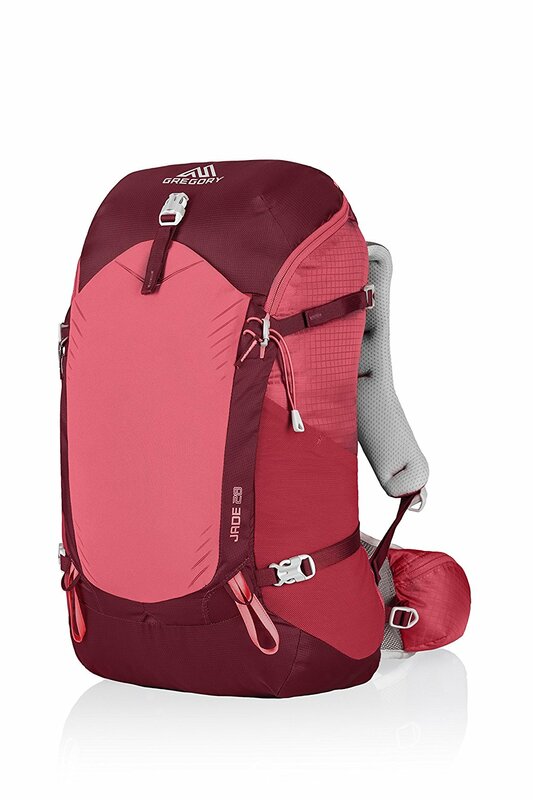 Rich had mistakenly placed his backpack directly on his water tube nozzle, and it oozed out all night, drenching everything in the bottom of his pack. I think I learned some new explicatives, after more than 25 years of marriage to him, when he discovered his mistake! When I assessed the situation, it was not nearly as bad as all the cursing would have indicated. Only the items on the very bottom of the pack were wet. 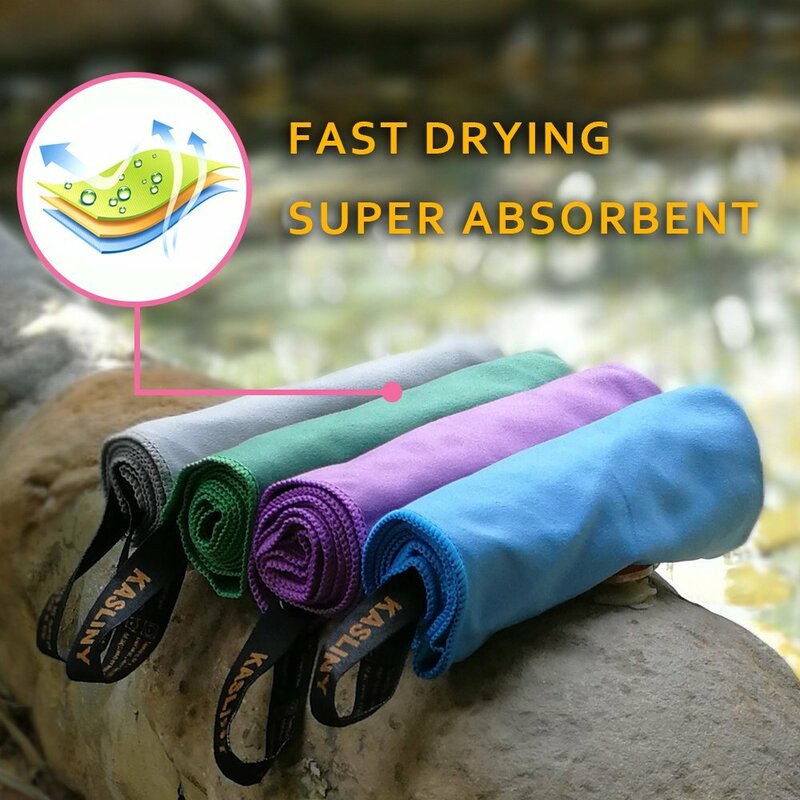 After he settled down, we simply set off for the day, with his long sleeve shirt draped over the outside of his pack to dry, and I had his underwear! Ha ha! 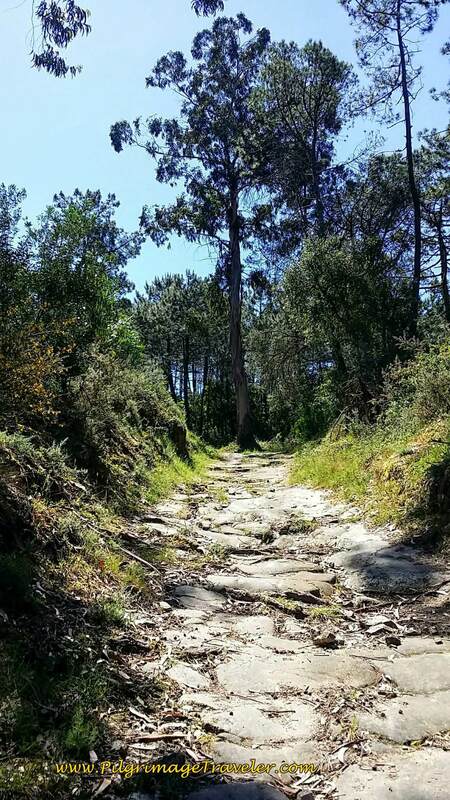 If you plan to walk on through to Marinhas, you can avoid Esposende altogether, by walking along the coast. However, we found the town to be quite lovely, with historic sites, churches, beaches, and nice cafés. 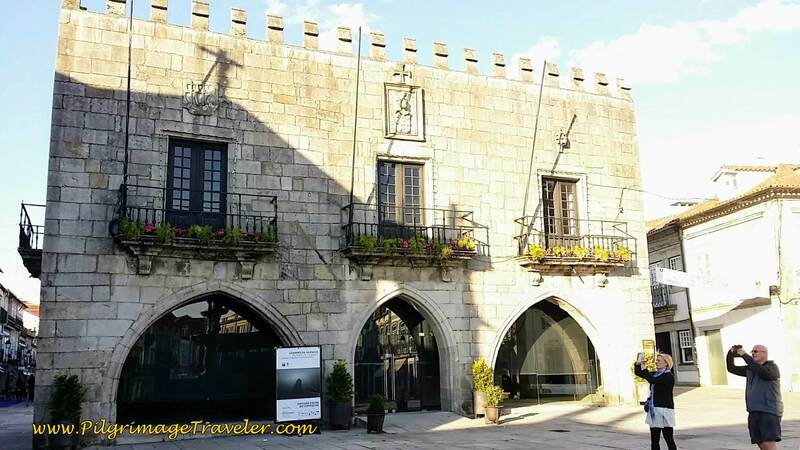 On the morning of day seventeen on the Camino Portugués, we headed north on the Rua Narciso Ferreira, from the Hostel Eleven, thru the main square, then walked across the plaza by the City Hall and onto the Rua Primeiro de Dezembro, below. 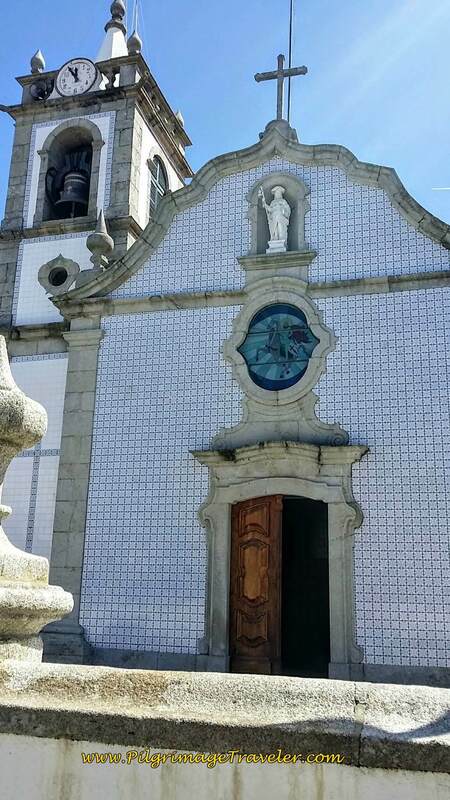 We quickly came to the church, the Igreja Matriz de Esposende, walked in front of it and through its plaza. 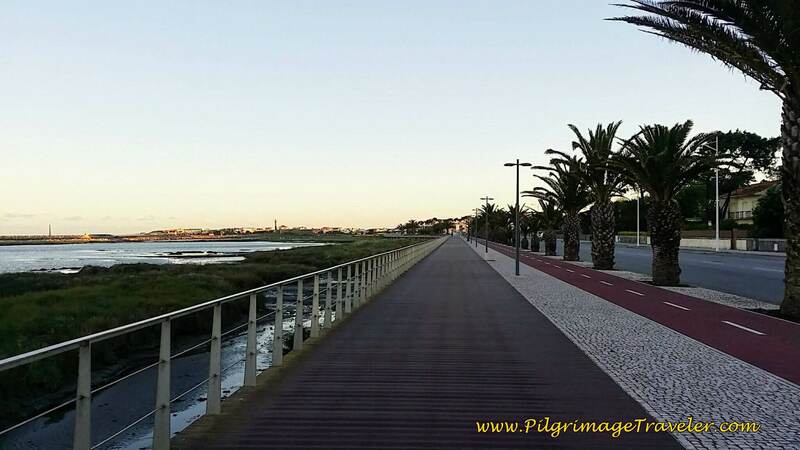 ...to join the Cávado River on the way to the sea, on a lovely coastal promenade with a sidewalk and bike track, pictured here. 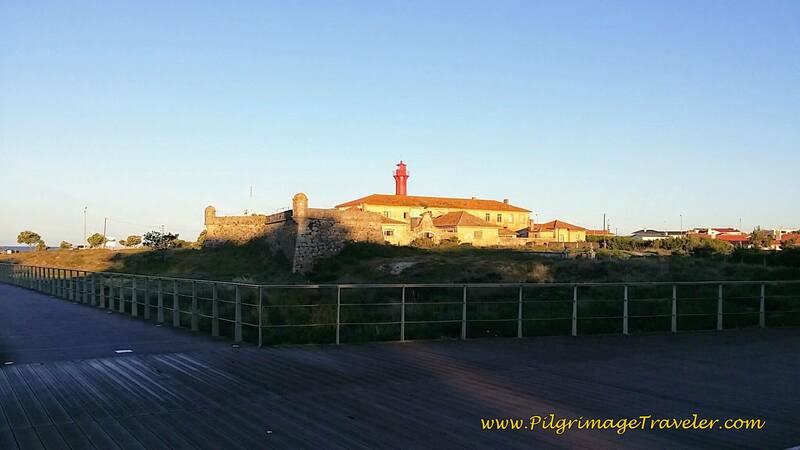 We walked by the Forte de São João Baptista de Esposende and a lighthouse, brilliantly lit by the morning sun. 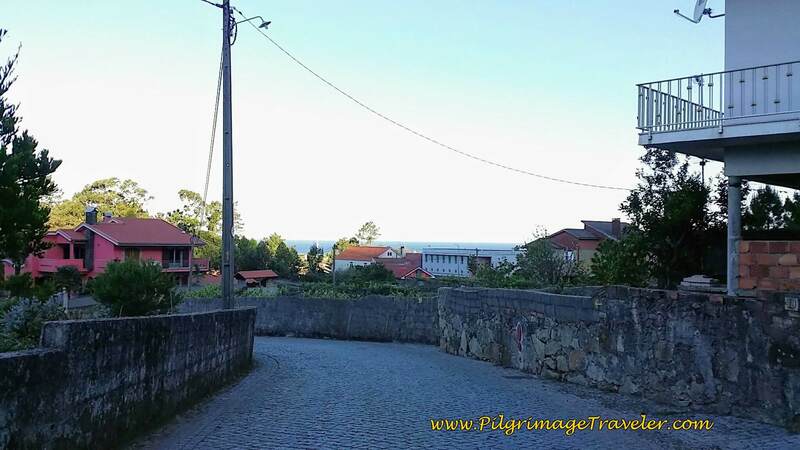 We walked along this sea promenade for about one kilometer, until the road bends eastward and becomes the Avenida de Banhos. 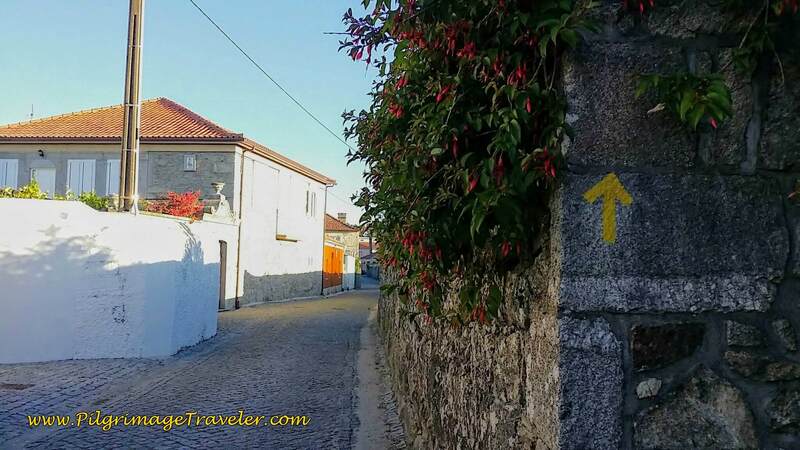 In 3/4 km, we turned left on the cobblestone road, below, the Rua da Agrela, to walk into the town of Cepães. After another 3/4 kilometer, we turned right onto the Avenida da Praia, below. 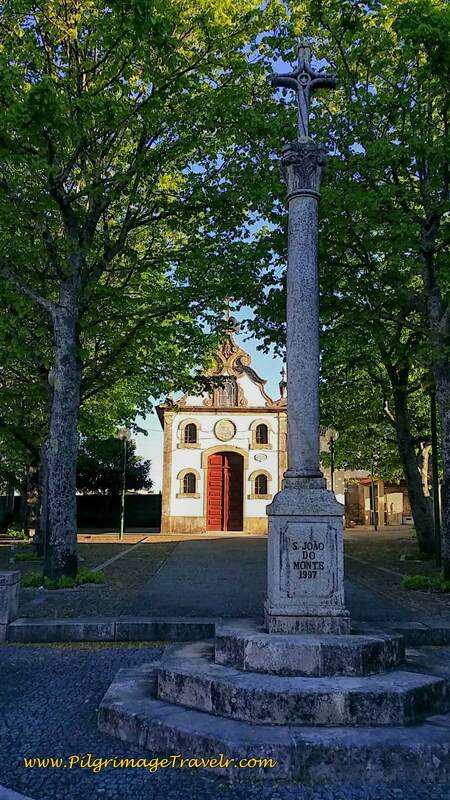 After about yet another 1/2 kilometer, the pilgrimage traveler must cross the busy N13, to have this small chapel greet you on the other side, the Capela de São Sebastião. 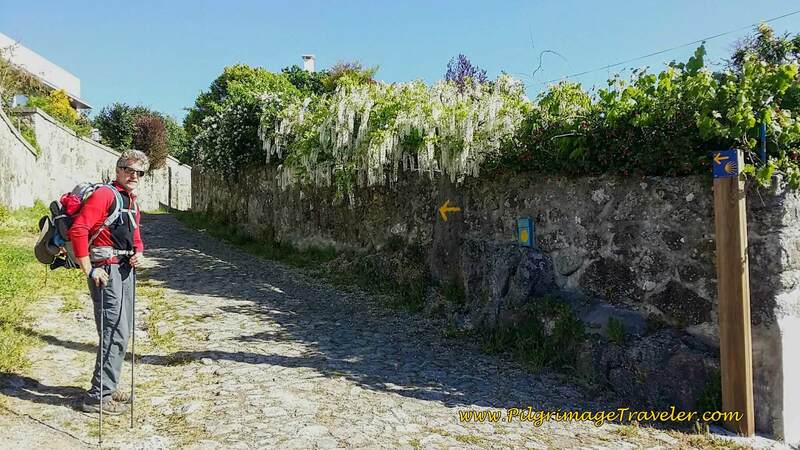 As you can see perhaps, the brown sign, below right, announces the way to the Albergue São Miguel in Marinhas. After the chapel, turn left on the Avenida Padre Francisco Cubelo Soares to walk into Marinhas and find the Albergue almost immediately, on your right, pictured below. It took us about one hour to arrive here, after 4.5 kilometers from Esposende. It would be a long walk back to Esposende if this small albergue is full, and the next accommodation is 12 km farther on in Chafé. The German ladies we met on day sixteen were looking out the window waving at us as we walked by. It was the first pilgrims we saw that day. 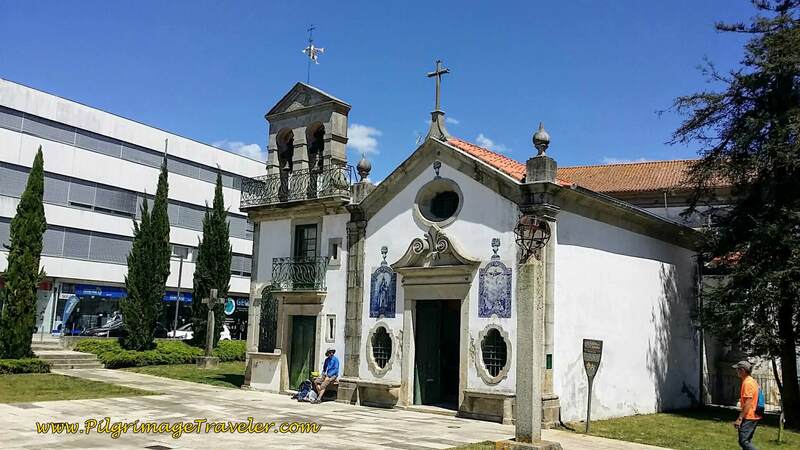 The Igreja das Marinhas is just down the street from the albergue. 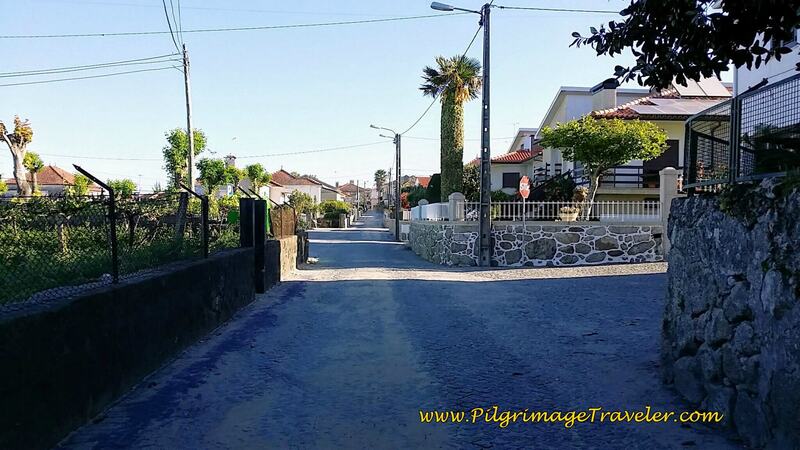 The road comes to a T at the church and the pilgrimage traveler must turn right on the Rua Conde de Madimba. There was a cafe open to the left of the church at 07:45 as we walked by ~ Important to note if you are staying in the albergue. After our lovely breakfast, just one hour ago, we kept on. After about 1/2 kilometer, turn left on the Rua de São João (Street of St. John), below. 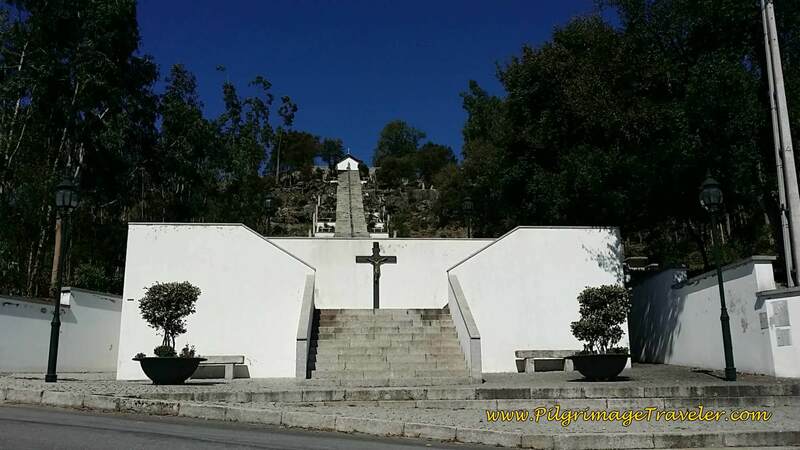 After about 1/3 kilometer come to a Y intersection, with the Capela de São João do Monte, below in the center of the Y. You are in the town of Monte. 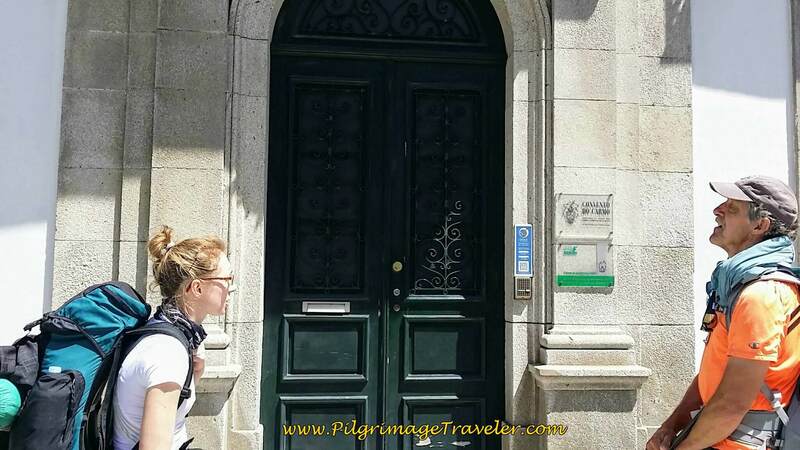 Turn right at the Y to walk past the Capela, and onto the Rua da Ponte Nova. Here it starts to become more rural-looking as you walk along the narrow cobblestone road. 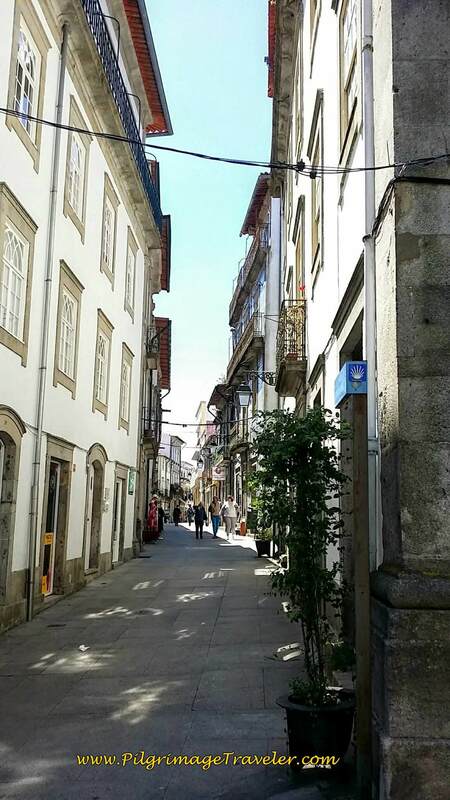 In a couple hundred meters the Rua da Ponte Nova becomes the Rua da Estrada Velha, pictured below. There is a ridge on your right shoulder to the East. You can see the sea to your left, west and now the pilgrimage traveler climbs a bit toward the first Alto or high point. The roads are of cobblestone. 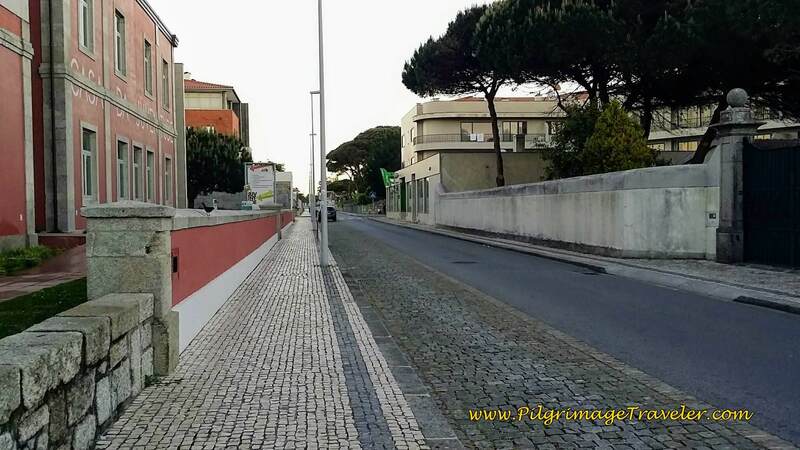 Then continue on the Rua da Estrada Velha for about 3/4 km, when the road name changes to the Estrada Real. 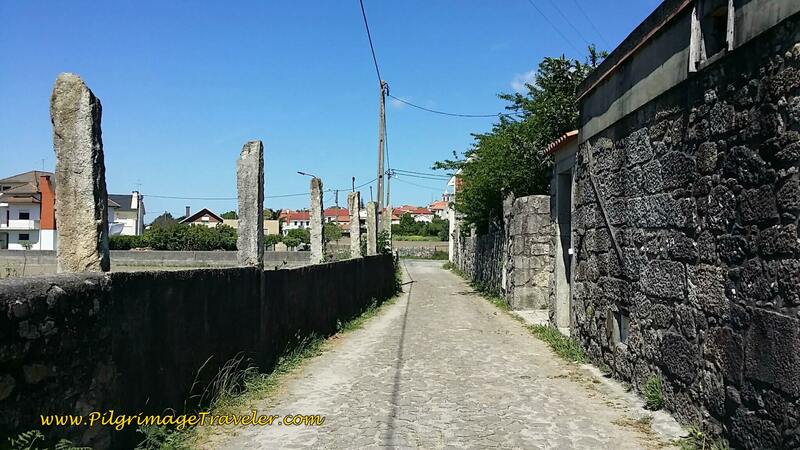 After one kilometer, the road takes a bend westward to become the Rua Marco do Rei, as it heads toward Oteiro. After 1/3 km farther on, we turned right onto the Rua Padre Almeida. 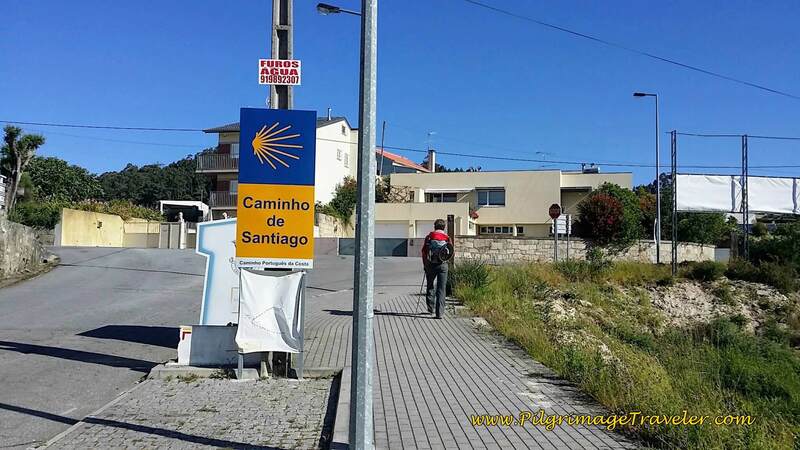 At the next intersection, we came to this signpost to the Café O Lampião, pictured below. We were ready for our first break, so we walked to the café, only to find it closed. A disappointment, for sure, but at only 90 meters from the sign, at least it wasn't far off the Way. To me, the walking thus far was relatively monotonous, with rural houses strung along the cobblestones, that all looked the same. I was as bored then as my writing this is now! 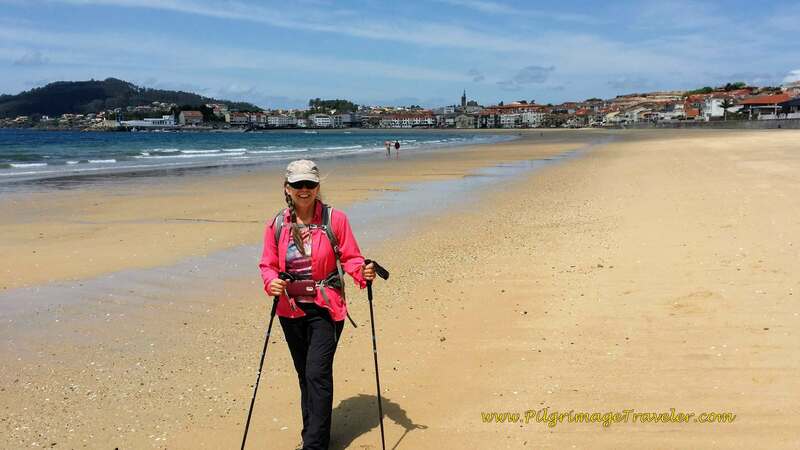 There were no other pilgrims to chat with, the weather was not bad, and I wished that we had take the Senda Litoral along the coast. 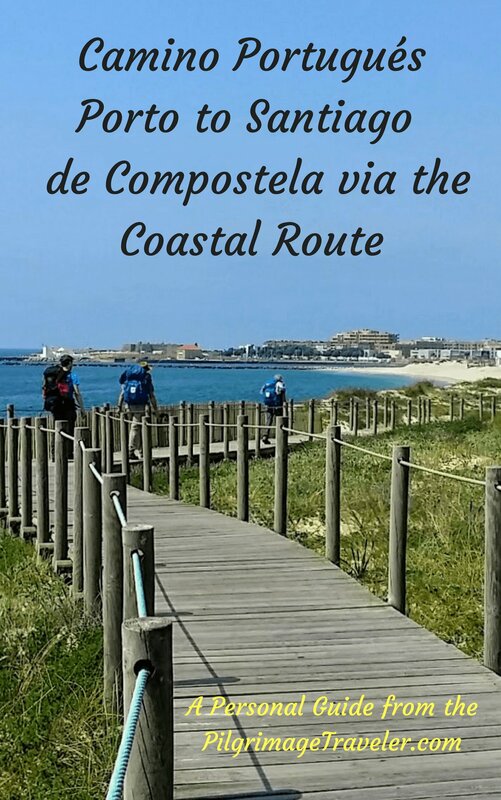 Having studied the day's route, I knew there were no roads along the coast, nor nice boardwalk systems for this leg, and we would have had to walk on the beach itself, for large stretches. I knew that wishing for the Senda Litoral was folly, however, it made this day's walk boring none-the-less! 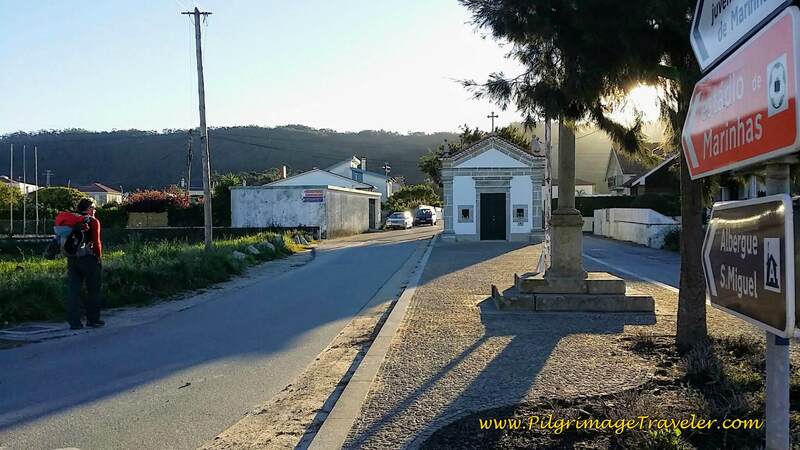 The next town on day seventeen of the Camino Portugués is Belinho, which you walk into within less than about 3/4 km after the signpost for the Café O Lampião. 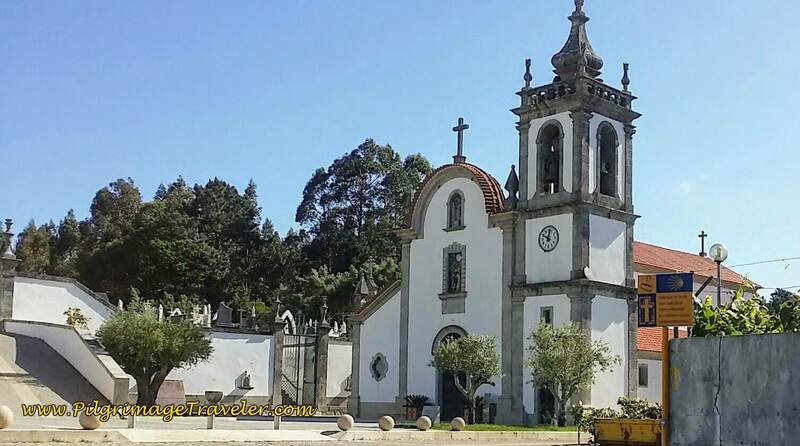 The church of São Pedro is on your right, in center of Belinho or also known as the the Junta da Freguesia de Belinho. I did love how the light danced on the steeple. 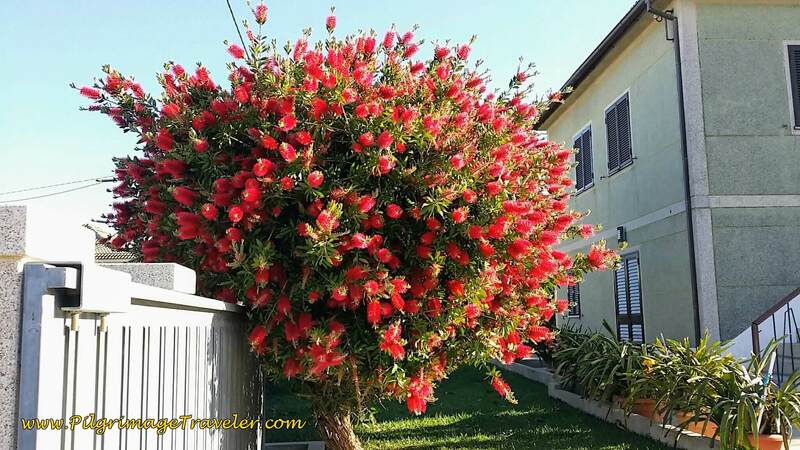 Then something unique caught my eye, this large and gorgeous Bottle Brush tree. In another 1/3 km, lo and behold the first open café appeared, the Gabriela. Just as we were about to give up hope! I think I was ecstatic after 9.4 km of hard walking on mostly cobblestone. We had a lovely break here. Nothing to cheer the pilgrimage traveler more than a café con leite and a pastel de nata! 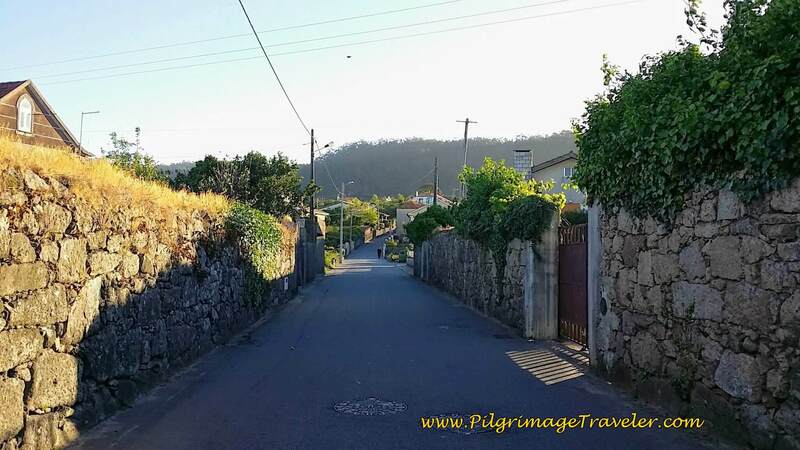 The Rua Padre Almeida continues to head north, paralleling the coastline, changing names as it walks the pilgrimage traveler on yet more cobblestone lined roads, now often with high walls. Houses continue to line the country roads, then suddenly it opens up into fields, after about another kilometer onward, along the Rua de Maracanã. 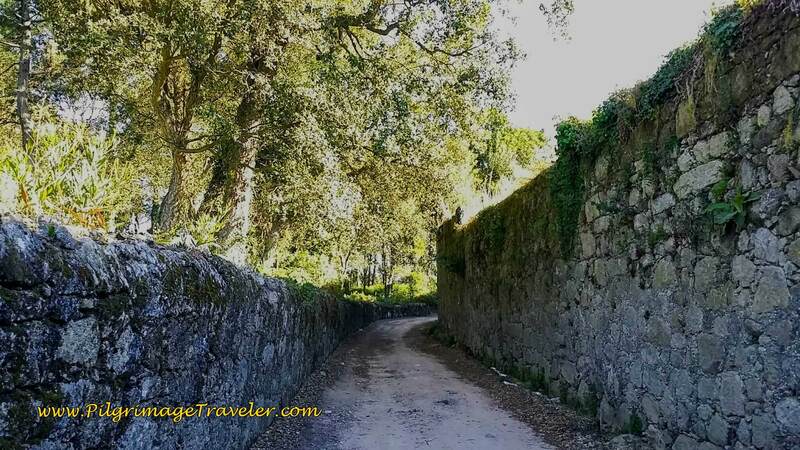 The cobblestone finally gives way to a dirt road and the Way is now a surprisingly lovely, narrow road, with high walls and a wild, overgrown look about it. The dirt Rua de Maracanã, comes to a T intersection with the EM546 at this chapel, I could not find a name for it, but it is still a great landmark. We turned left at the chapel to walk only briefly on the busier road through the town of Estrada. Then shortly, we turned right onto the Travessa do Ferreiro. At the end of this street, you come to a T with the busy N13, with these two buildings, pictured below, on the other side. 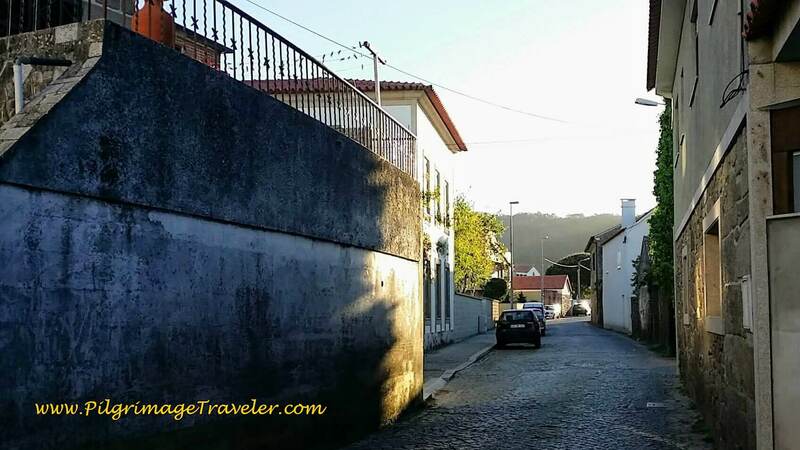 The Way is on a quaint dirt street between them, called the Rua da Carnalha. 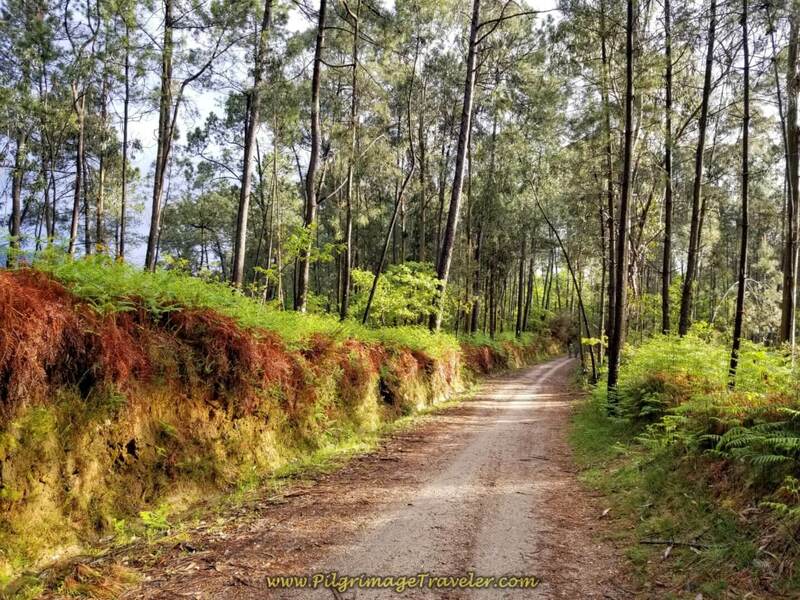 This dirt road leads you into a lovely forest for a nice change in scenery, continuing along the Rua da Carnalha. What a nice change for the sore feet! In only a few hundred meters, the dirt road comes to this nice pillar, below. This is where we turned onto the path and through the woods, with the sounds of a creek on your right. This is the Rio Neiva you are hearing. In about 0.6 kilometers, you come to this bridge to cross the river. In high waters, one has to take an alternative route. There is a nice information board here, on the other side of the river. We turned right after the crossing to climb a significant hill on a nice wide dirt road. At the top of the hill, we turned right on the Rua 809 then almost an immediate left on the Rua 802, which is now rough and unimproved cobblestone. We left the woods for a more rural appearing countryside. 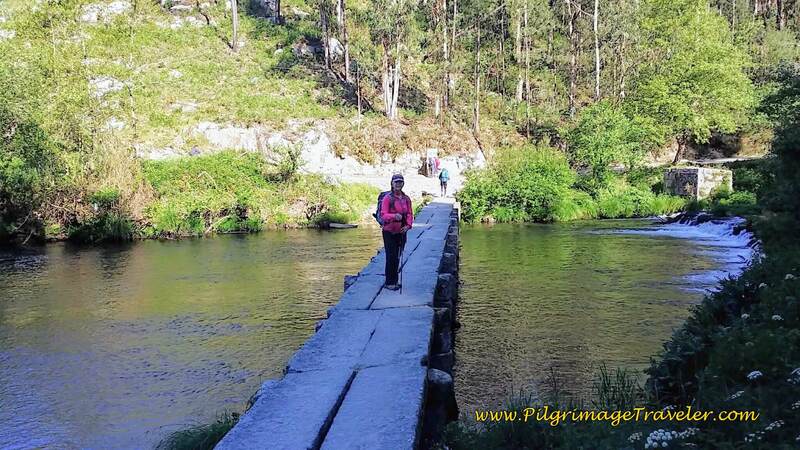 Our day seventeen on the Camino Portugués was now definitely picking up in its character and in the feeling of adventure! I was loving this "simple" life, in this section! 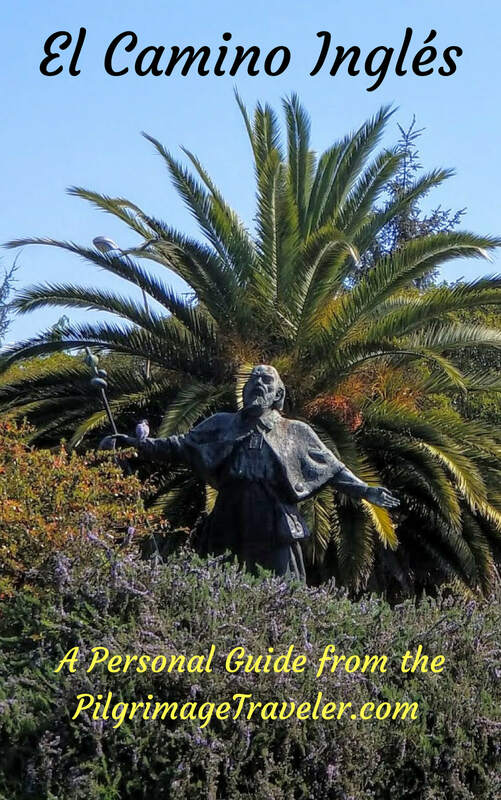 The pilgrimage traveler then comes to a T at this church, below, and you turn right onto the Avenida de Moldes. 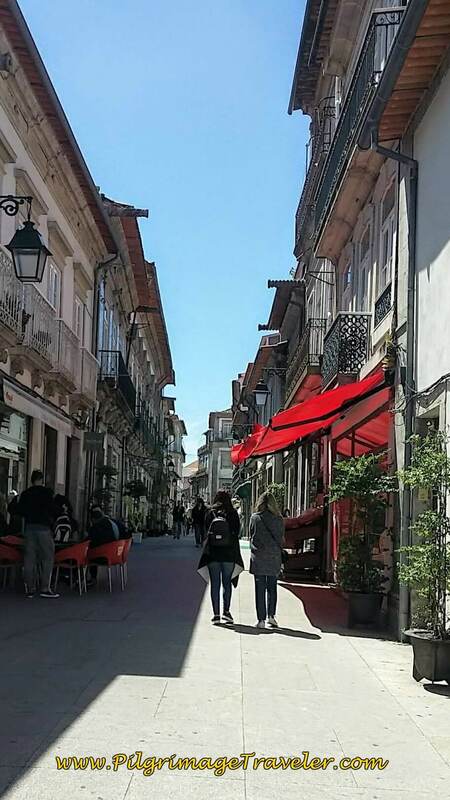 After a brief way the Camino led us to a side street that parallels the Avenida de Moldes, then joins it again, for a total of approx. 3/4 kilometer. 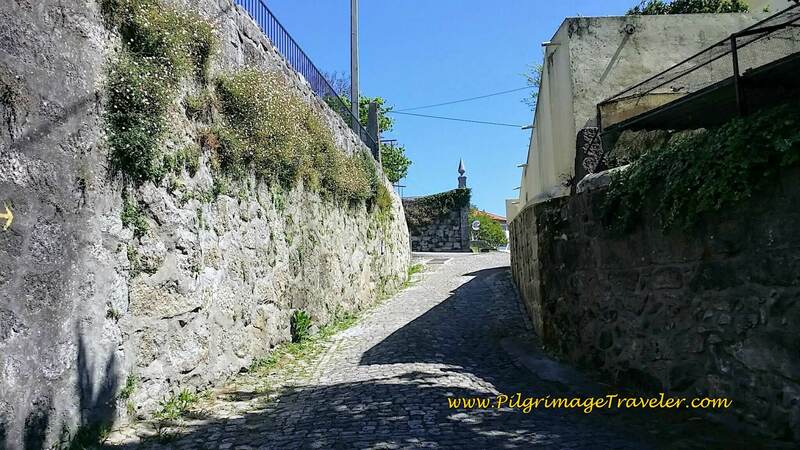 ...then immediately left on the quaint cobblestone lane, the Travessa de Santiago, pictured below, a shortcut to the Avenida da Igreja. 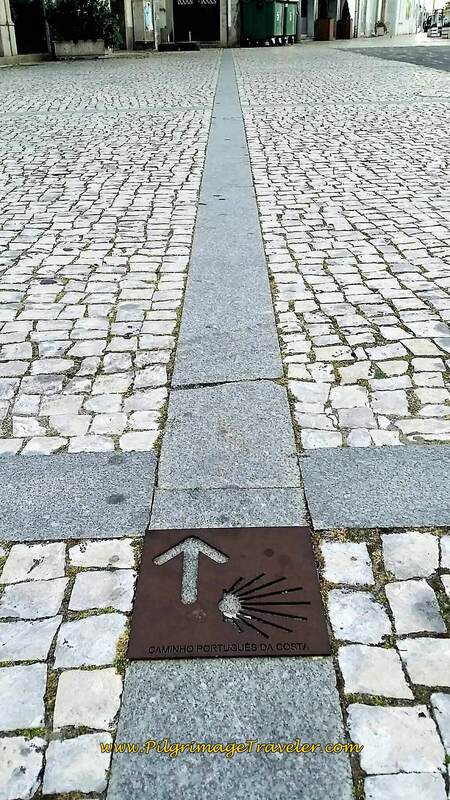 This is the way to the famous pilgrimage church of Santiago. Let the climb begin! The Travessa ends at the Avenida da Igreja and we turned right onto it. 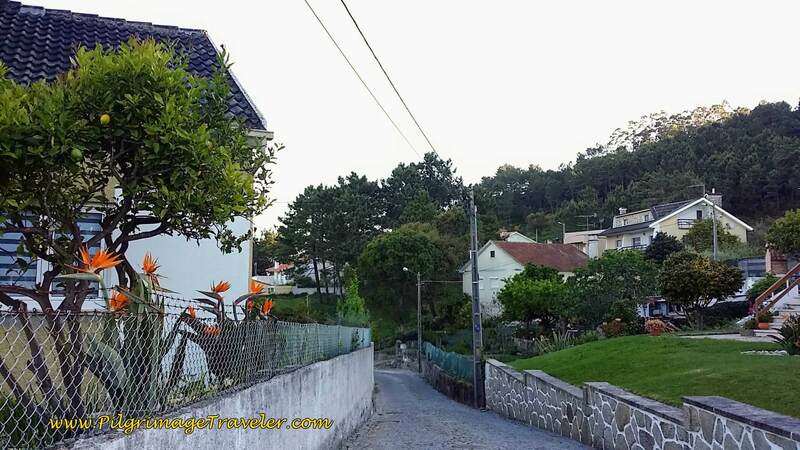 Now the road climbs even more steeply to the Igreja Santiago. 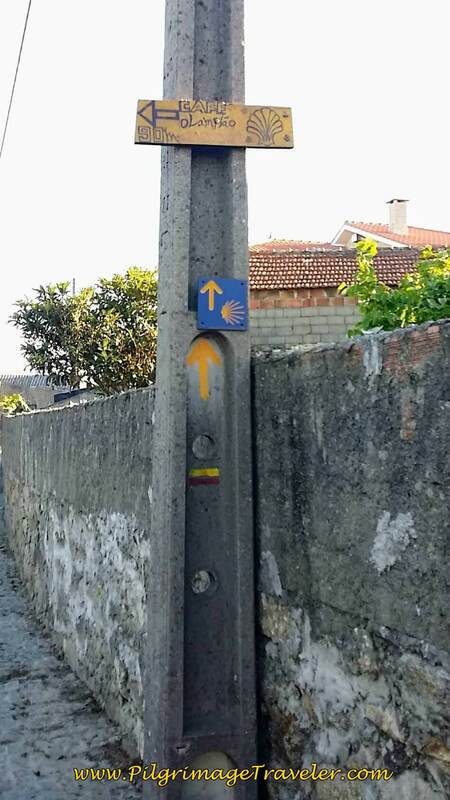 First, you come to a Camino marker, pictured below, only 100 meters from the church, at the top. The Santiago Niche is just 50 meters before the top. It was a lovely and welcome sight! The distractions along the way helped alleviate the climb. Here is the Santiago Church, or officially, the Igreja de Santiago de Castelo de Neiva, in all its glory at the top. We are almost exactly one-half the distance of our day seventeen on the Camino Portugués at this church. 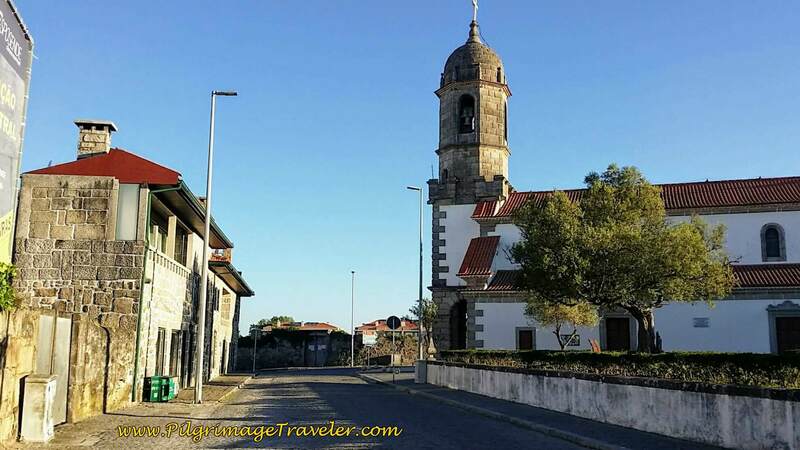 The significance of the Igreja de Santiago is that within it was found a very old inscription that refutes the notion that the Portuguese Coastal Route was not an official medieval route! This inscription was found during the church's renovation in 1931. The inscription shows the dedication of the church to San Tiago the Greater in 862 by a bishop named Nausti, the Bishop of Coimbra at the time. Today, this inscription can be found inside the church behind the side altar, on the right as you enter through the main door. 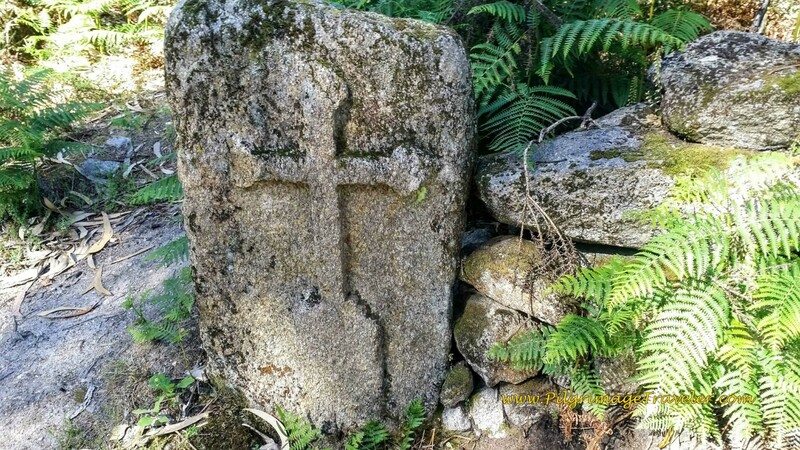 It proves that devotion to San Tiago had spread south of the Minho River, this being the most ancient coronation to San Tiago outside of Spain. After visiting the church, continue on the Av. 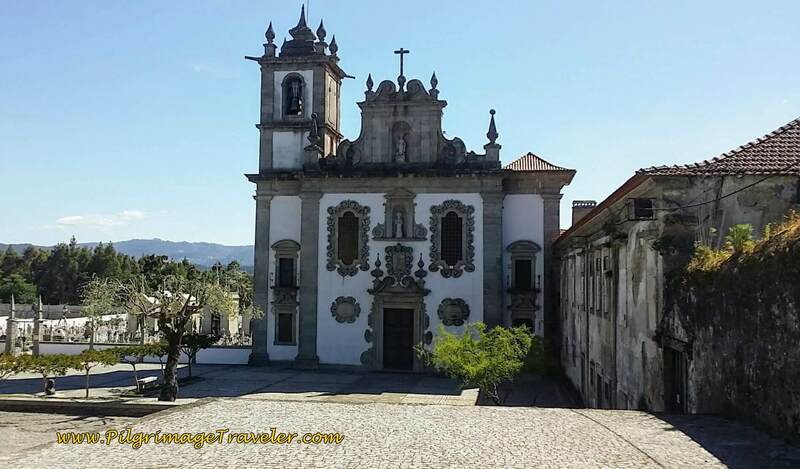 da Igreja and enjoy the astounding views from the top. Farther west, when the road becomes divided, take a right turn to go up the hill unto a dirt lane. You can see the prominent waymark in the photo below. Turn onto a path which takes you uphill a bit more, then by the cemetery behind the church. It is downhill from here on double track, through a wonderful forest. 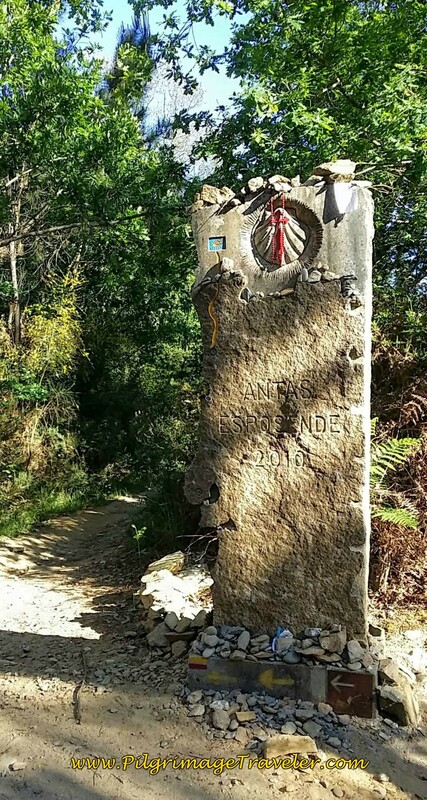 As you wander along the double track, you come to another pillar, below, where the Camino turns left again onto a single track, farther below. Notice the kilometer mark at 187! 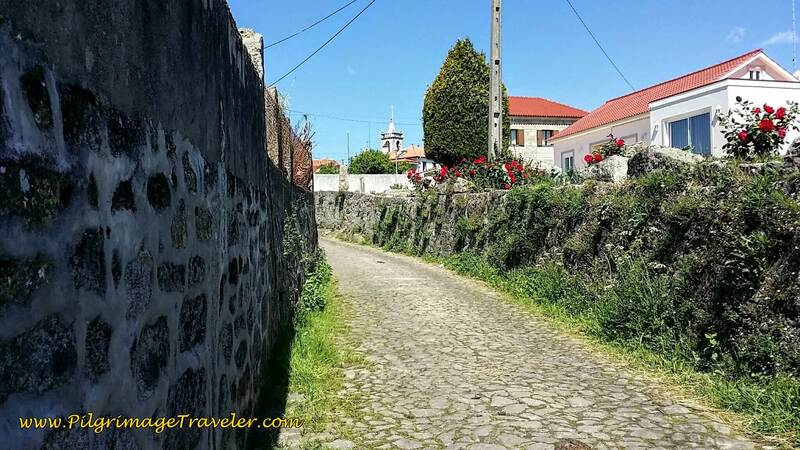 The single track joins a dirt road, the Rua Jose Agostinho Peixoto to walk through the hamlet of Monte (not pictured). 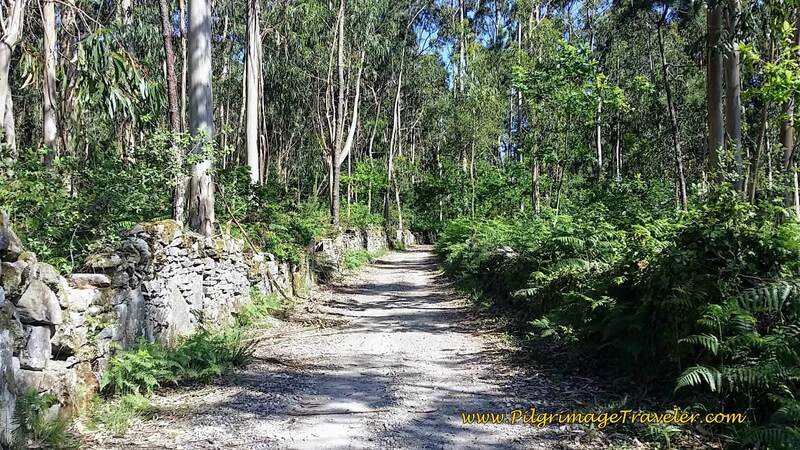 Take a hard left in Monte on another dirt road, and onto the Travessa do Caminho de Santiago. 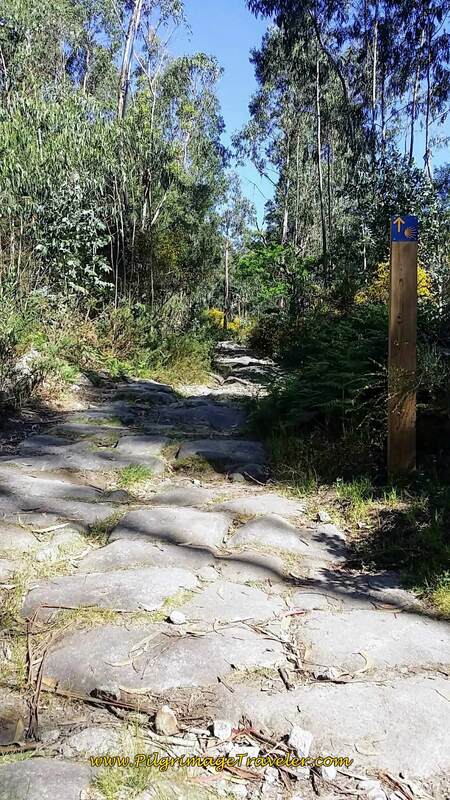 After the town, we came to what looks like an old Roman, or perhaps at least a medieval road, on the Travessa do Caminho de Santiago, below. This road was not in our guide book, so I could only guess at its origin. But I did love walking upon it. It always feels like I am a "real" pilgrim when I walk on these ancient roads. 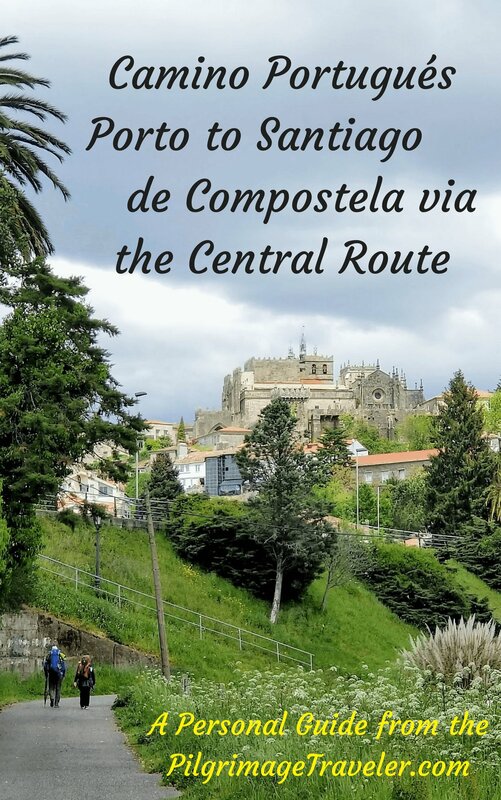 Especially with a road name like, "Travessa do Caminho de Santiago!" The pleasure of pilgrimage at its finest! 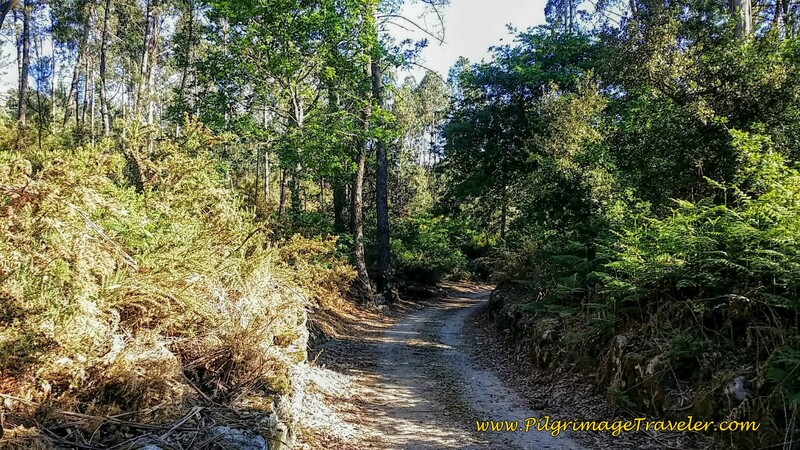 The Travessa bends to the right, but the Camino continues northward, continuing through the forest. We stopped for a picnic lunch, at a trail juncture where the path turns hard to the right. 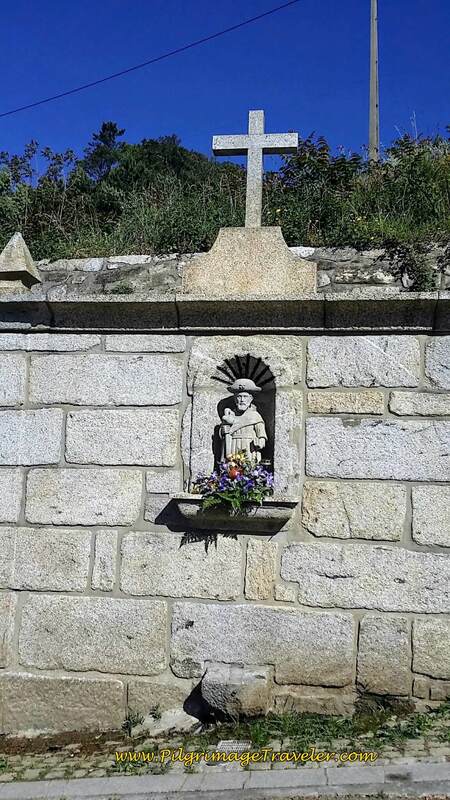 As I was finding a nice place to sit on a stone wall, Rich suddenly stumbled serendipitously onto this carved stone cross, below, set in the wall. We were essentially in the middle of nowhere in the forest! It was a nice surprise as we were eating our picnic lunch! It must have been a reminder to those working in the fields, to maintain a worshipping heart? Who knows? Maybe it was a waymark for them too? I had fun imagining the reason for its existence. 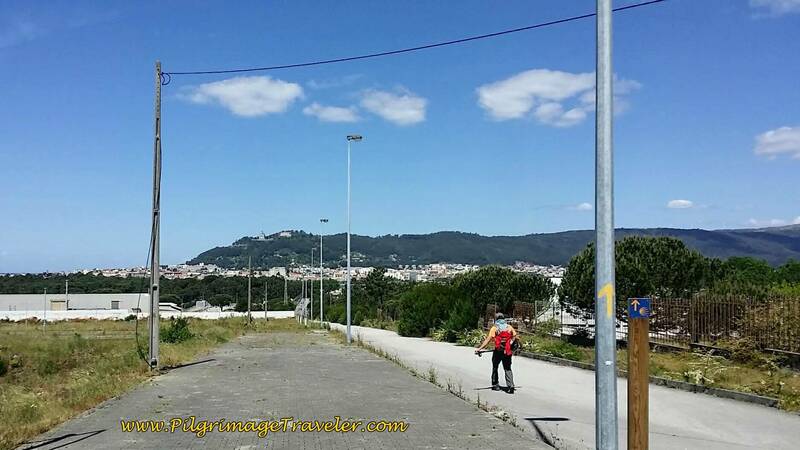 I was noticing on day seventeen of our Camino Portugués, that it looked and felt more like Galicia. Yesterday, the cobblestone really got to my plantar fascia at the bottom of my right foot and it ached during the night. I made Rich massage it! 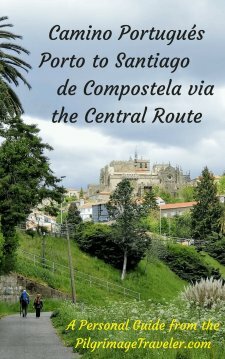 I was doing better today, maybe because we were getting close to Santiago de Compostela? I watched my feelings, and couldn't determine what exactly it was that was making me happy and excited. We had only one more day left to walk in Portugal. Then we would actually be in Galicia! 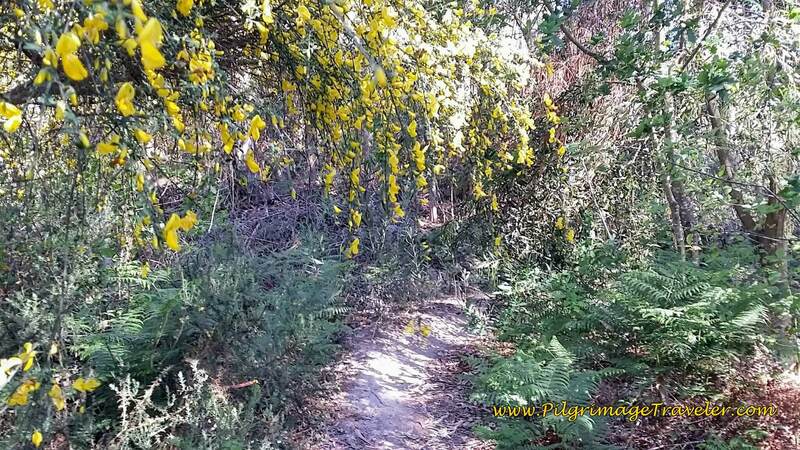 The walled forest paths were charming, below, as we continued onward. 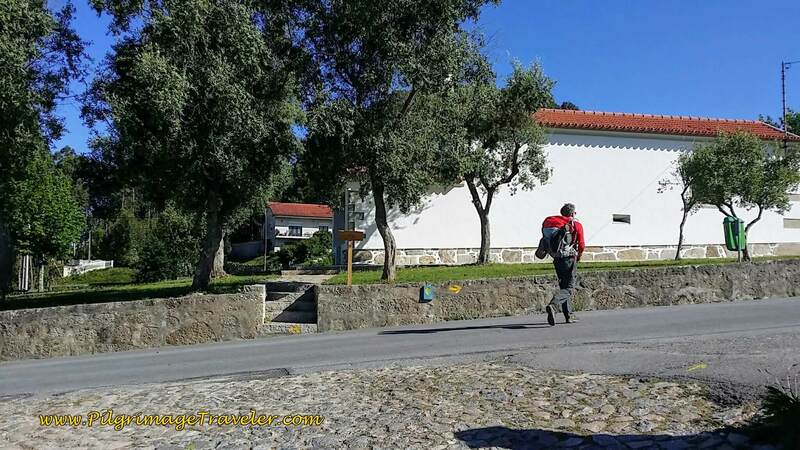 ...and to the Chapel Senhora do Crasto, directly opposite, on the other side of the road and at the top of this long flight of stairs! If I had had more energy, I would have loved to have climbed up this very long flight of stairs, to see the view! Alas, I did not. It looked like a lovely shrine. 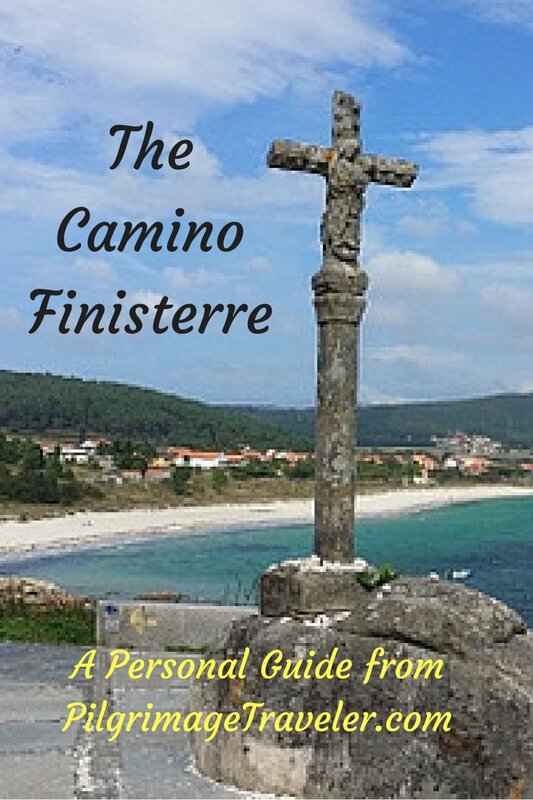 After walking by the monastery, the Camino turns left immediately onto another paved road, and then briefly back through the forest. The scenery consists mostly of rural villages on this next stretch. 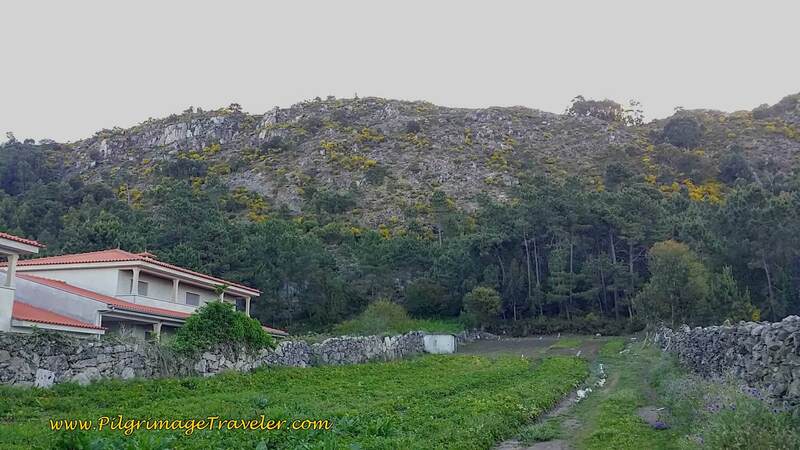 Here are the first houses, I photographed, below, as we walked toward the next town of Monte do Sul. 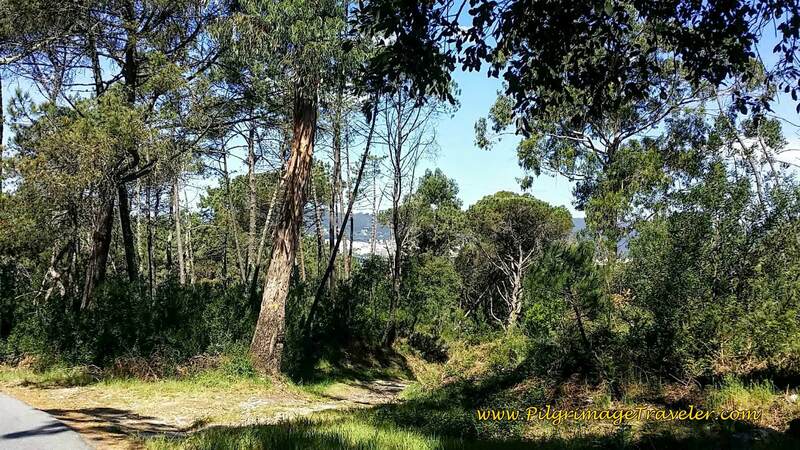 You can see our destination ahead - Viana do Castelo! 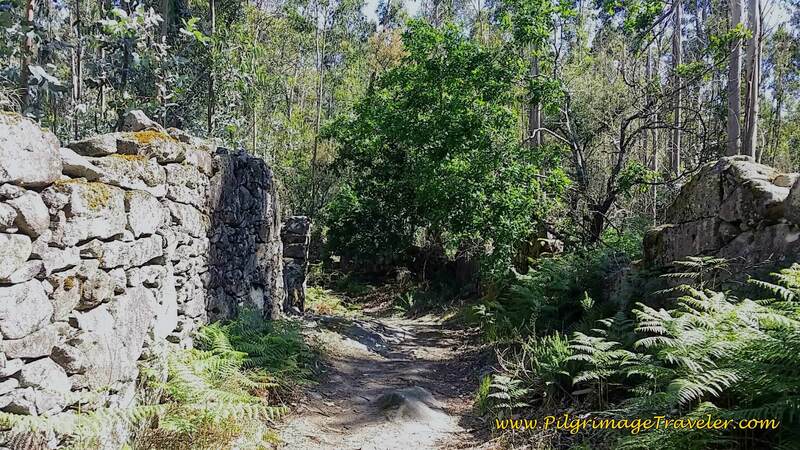 After 3/4 kilometer from the Monastery, turn left onto a narrow dirt road, the Caminho da Rebadeira. Come to a T intersection, turn right to walk into the town of Chafé. We walked by two open cafés in Chafé, if you need a pitstop. 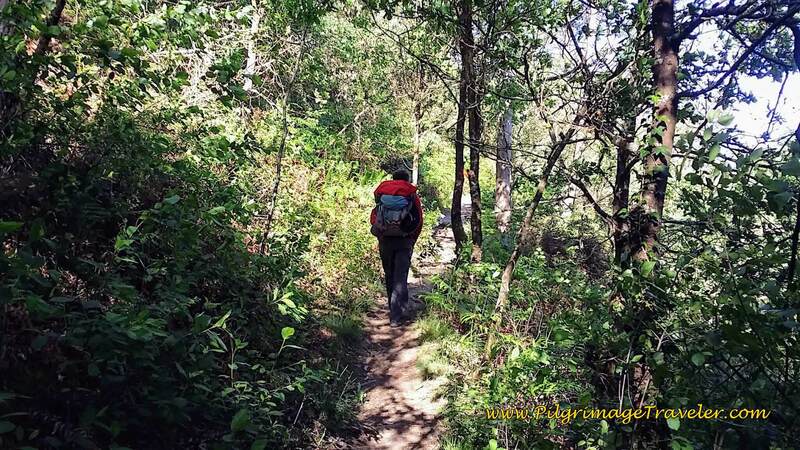 At this point we had only 9 km left to go to Viana do Castelo. Some time after lunch, I digressed a bit, felt less energetic, and had to ask my right foot to pull as much as my left, My left toe pad started to hurt again. I was glad that our destination was not far away. In Chafé, a Camino angel came running out with a bucket of oranges from his tree, and gave us 4 total, 2 to eat and 2 for the road. He chatted and said he was born in Germany, but lives in Portugal. He initially tried his German on us, which didn't work well, then switched to Portuguese. I was able to understand most of what he said, with my Tarzan Spanish knowledge. The pilgrimage traveler then turns left in Chafé onto the Av. 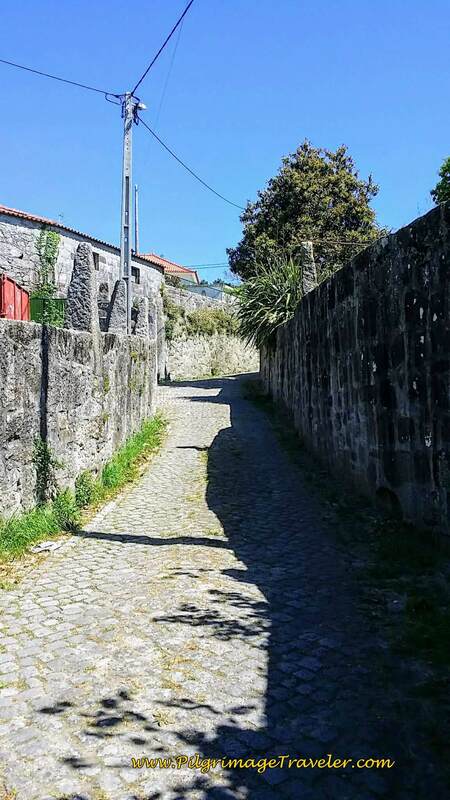 da Amorosa; A right onto a narrow dirt road, the Caminho de Entre Quintas, bend to left, then right again on the Caminho da Escola, to pick up the Caminho da Ribeira to walk through the hamlet of the same name (Ribeira). 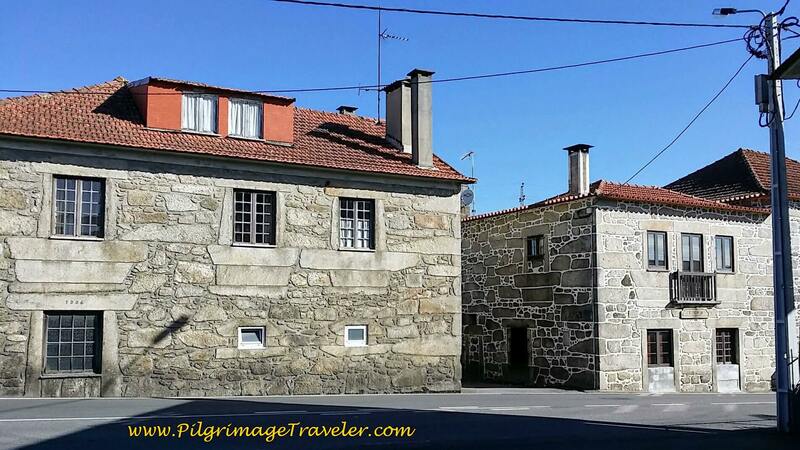 Right before Ribeira, there is an amazing-looking hotel, called the Casa da Reina, that the Camino walks right by. If you need a break from the albergue grind, this many be your ticket. We walked onward. 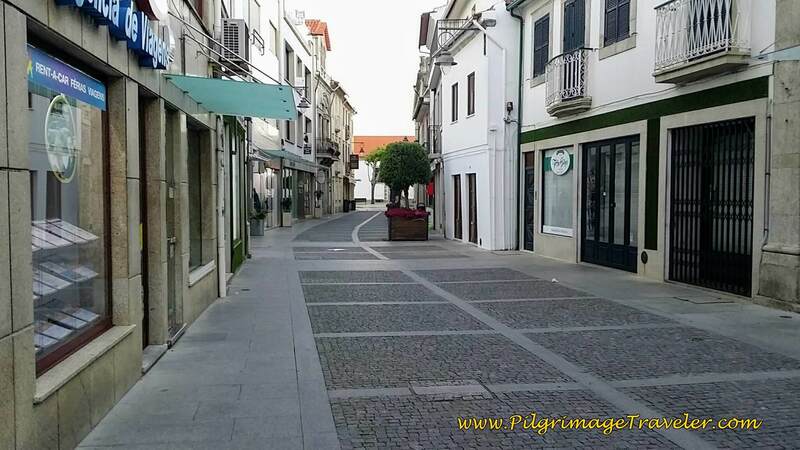 Next, take a right turn on the Rua do Noval, to walk past the town of Noval. 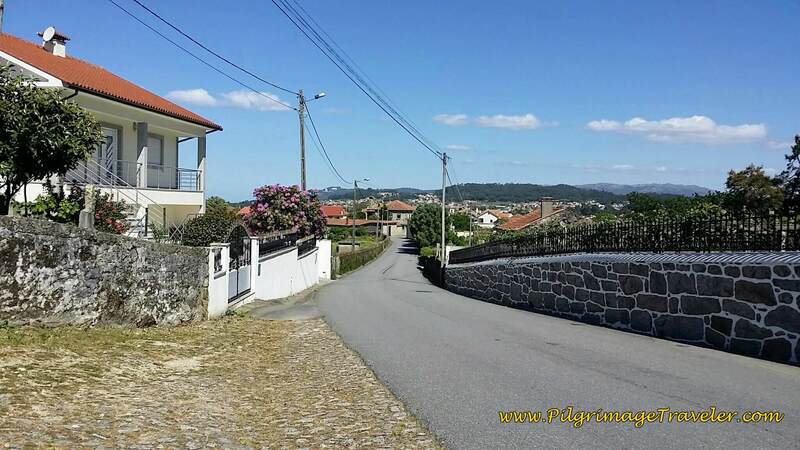 Then a left turn on the Rua da Casa da Fábrico, leading to the town of Anha. 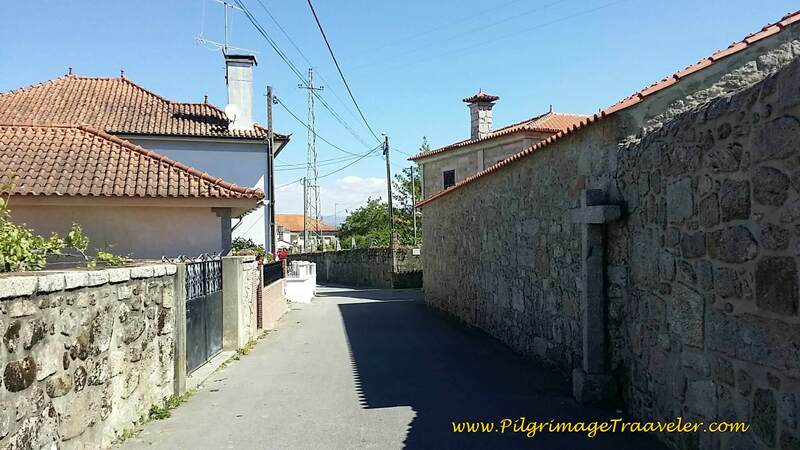 The Rua da Casa da Fábrica, is on the way to the church in Anha, with its steeple in sight, ahead. 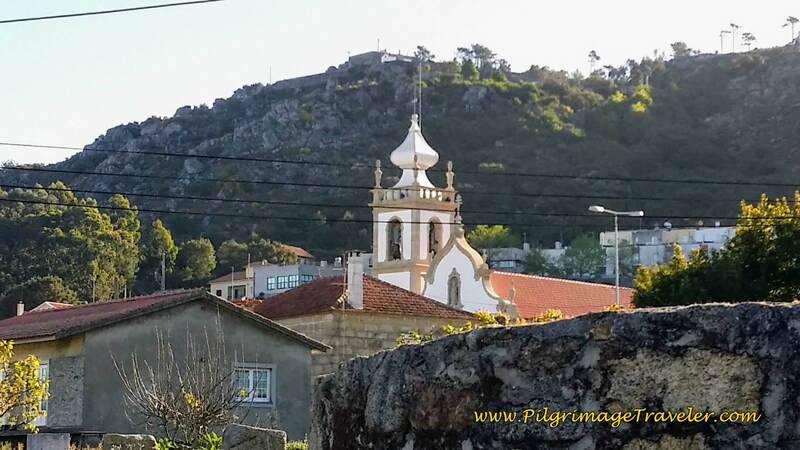 The church in Anha, the Igreja Matriz da Paróquia de São Tiago de Vila Nova De Anha was an inspirational place for me, on day seventeen of the Camino Portugués, and it revived my spirits once more. Church bells were playing a lovely tune, during our visit. I sat and listened for a long time, filled with beauty and wonder at the Mystery of it all. 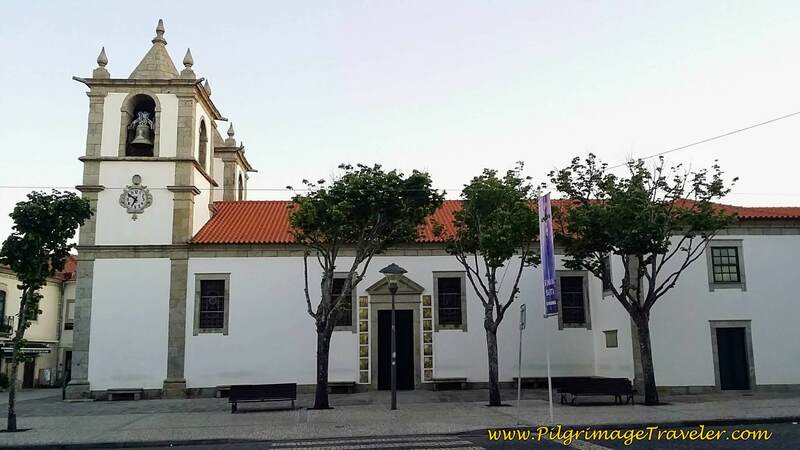 This lovely little pilgrim's church, with its welcoming statue to São Tiago (San Tiago) was open, I am sure, especially for we pilgrims, stumbling by. As I sat and listened to the bells, it felt like they were ringing just for me! I was grateful to the town and it's willingness to use its resources to maintain this peaceful place for all to enjoy as they passed by. So very few churches were open along the Way. The pilgrimage traveler is able to get a stamp here, self-serve style. 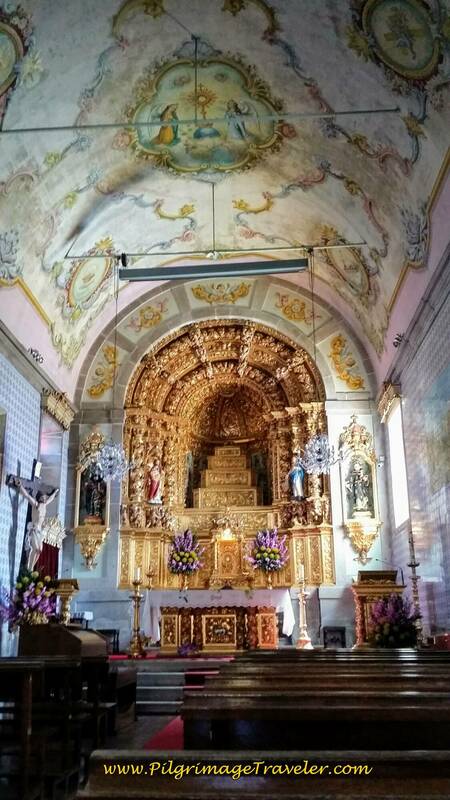 There is a gorgeous gilded altar and painted murals in this wonderful little intimate and blue-tiled pilgrim's church. We reluctantly continued past the church, on the Rua da Casa da Fábrica, turning left to join the main road northward, the Largo 9 de Julho. 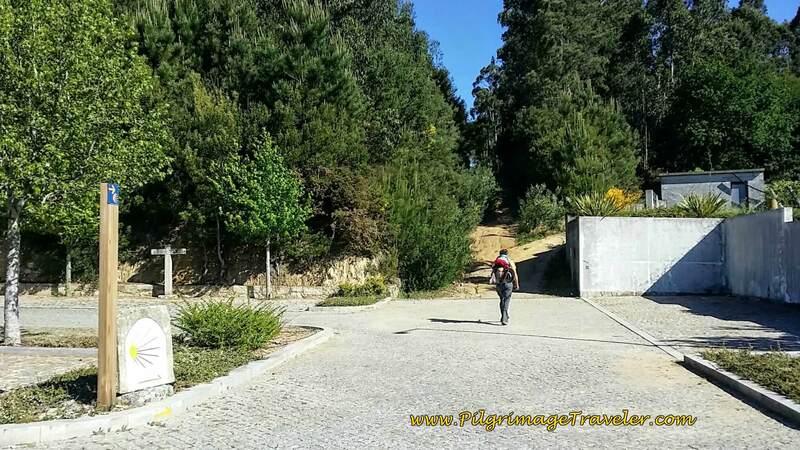 In about 100 meters, we joined the small cobblestone side road, the Dom José de Alpuim for 1/2 km. 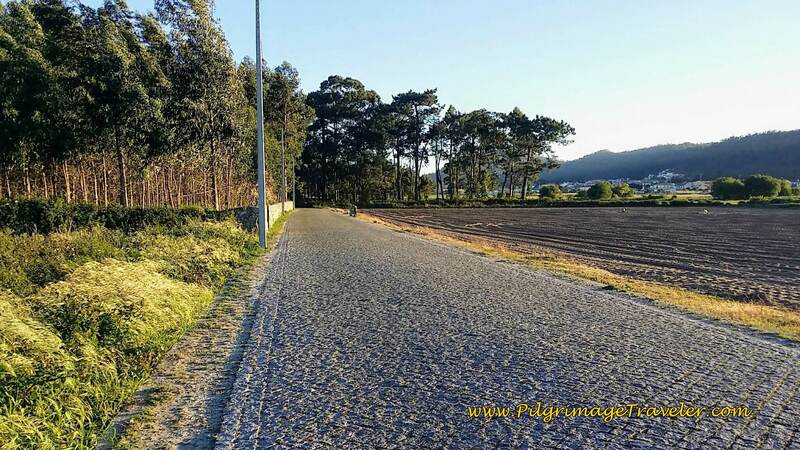 The road ends at this photo, below, at the wine estate, the Quinta do Paço d'Anha. You can see an entry pillar in the photo. 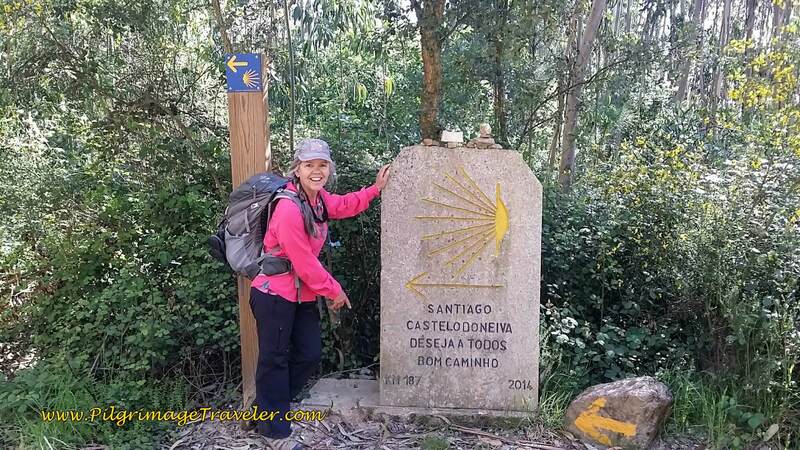 This is where we turned left onto the Avenida da Estrada Real and began another ascent. 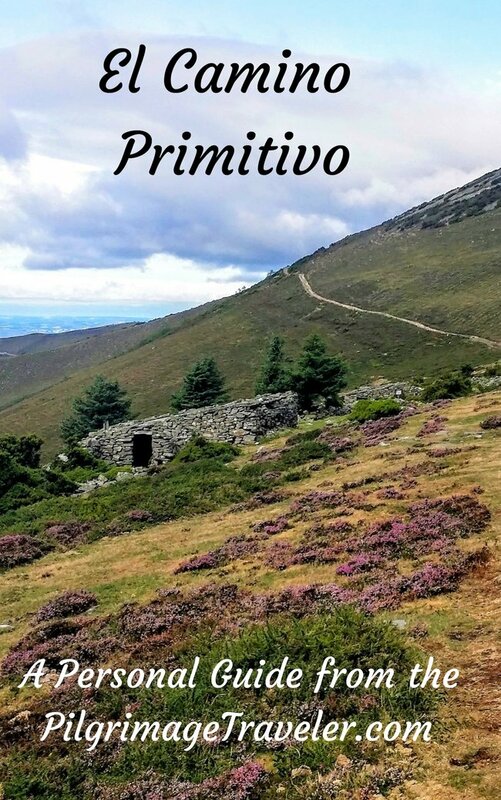 We walked steeply uphill, through the town of Penedos and towards the second "alto" or summit of the day. Shortly after Penedos, you will have finally reached the top of the climb. 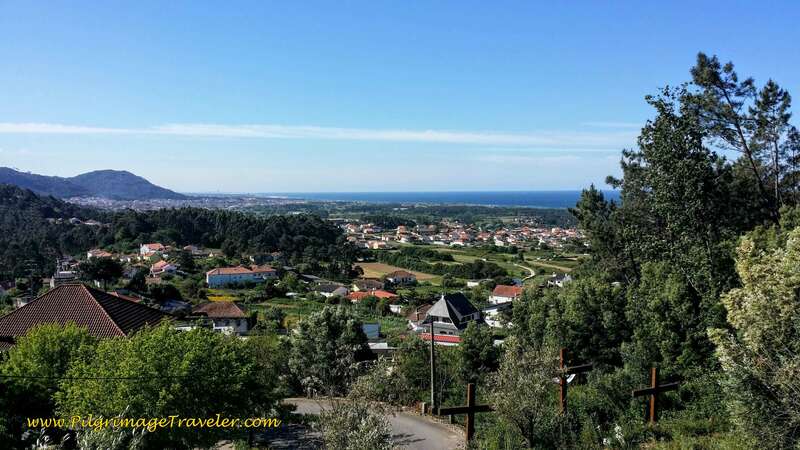 It is nothing but a descent from here, towards Viana do Costelo. 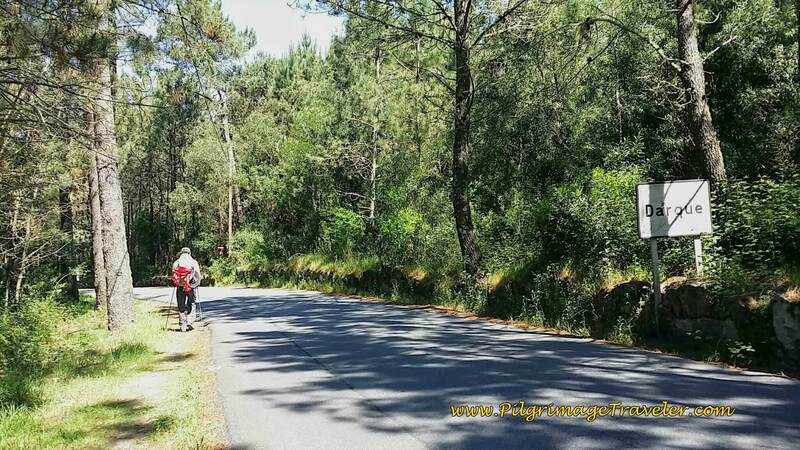 After about 1/2 kilometer, the Avenida da Estrada Real becomes the EM544 and shortly thereafter, the Camino turns right here onto this forest road. ...and continues down the hill to join the EM544 once again. 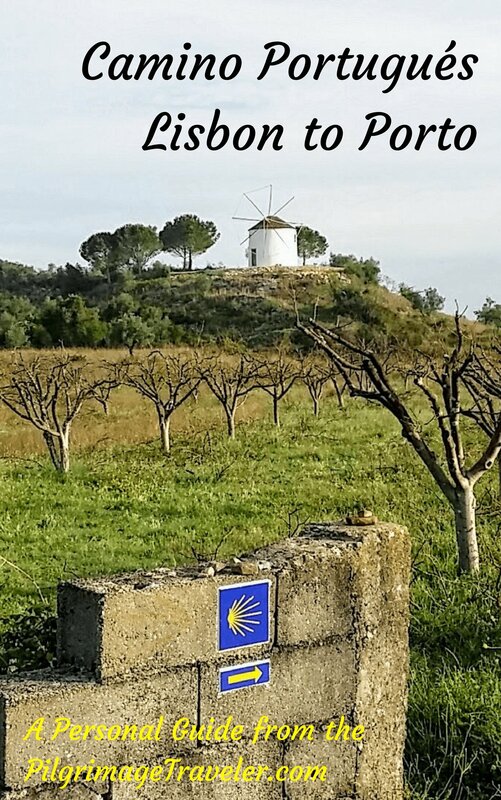 Soon after rejoining the EM544, the sign for the town of Darque appears. 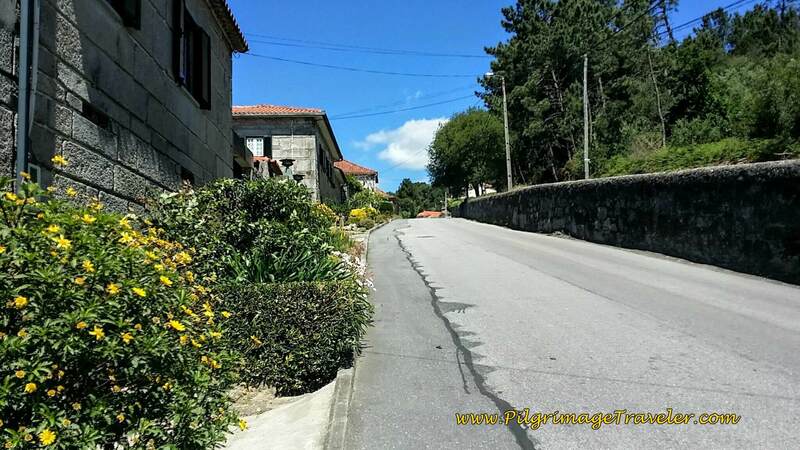 Walking down the EM544, is a short quarter kilometer jaunt, and suddenly you are on the southside of Viana do Castelo. 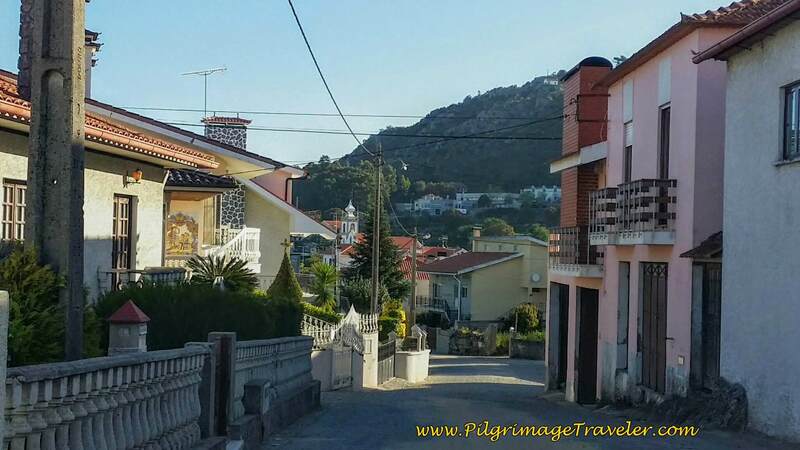 It was exciting to see the town ahead, with it's famous chapel, the Santuário de Santa Luzia on the hill, as you steeply descend the EM544. The forest opens and we were approaching the metro area. The highway bends west, but we continued straight, here in the photo below, directly towards town. First, you walk through an ugly, abandoned development, and then continue straight through a sandy shortcut. I called this the "sand trap" because it is a trail with deep sand. It was dry when we crossed. I can only imagine the muck when wet. 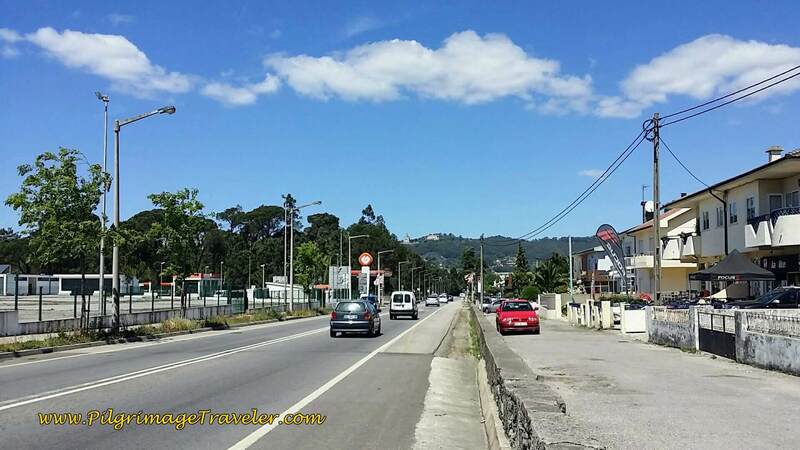 We stumbled out of the sand trap onto the N13 at a roundabout, and walked on the busy road through Cidade Nova. There are lots of shops and restaurants here if you need. 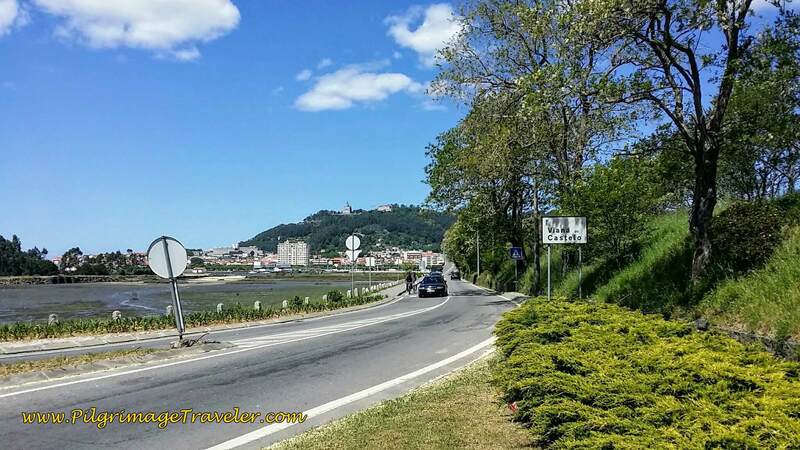 Continuing on the N13, the sign for Viana do Castelo appears, just before the River Limia. 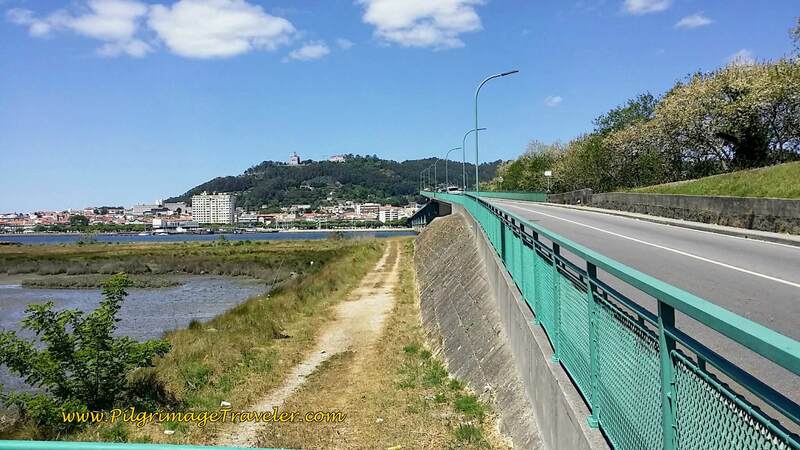 Follow the N13 across the River Limia on the bridge, the Ponte Eifel, along the Rua Dom Afonso III. The Way is tricky when you get across the river. 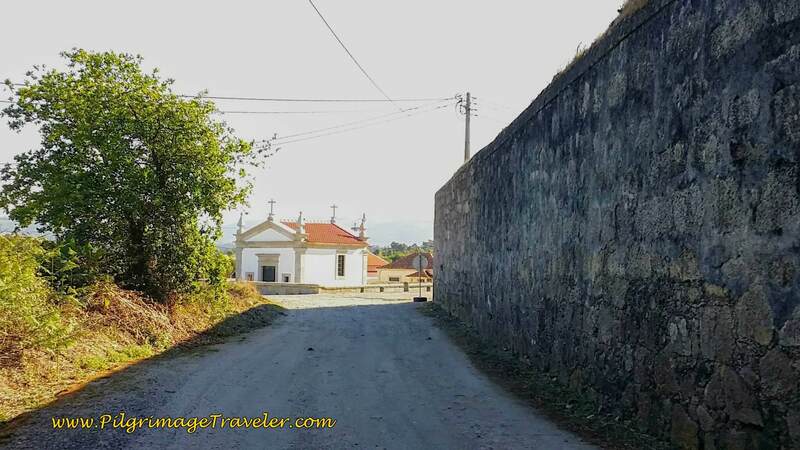 If you are headed to the Albergue de Peregrinos de São João da Cruz dos Caminhos in the church (Igreja de Nossa Senhora do Carmo), that you can clearly see to your right after crossing the bridge, but the wall between highways divides you, keep walking north. Keep the church on your right as you walk past the it until you come to a pedestrian underpass, to take you safely under and across the train tracks and the highway. Then head back south to the church. Walk past the sanctuary doors to the convent door, the Convento do Carmo, and find a tiny blue sign on the door, identifying the albergue. See the photo below. Read the sign with instructions, reminding you that check in is from 1500 to 2000 hours. We were lucky, as a kind monk let us in prior to 1500, just to store our backpacks, when we arrived early in the afternoon. Those coming after us were not so lucky. So it's anyone's guess what you might experience if you arrive before 1500. We met Tatiana, a Czech pilgrim, above left, while we were waiting for a response at the Convent. She had arrived shortly after us. After dropping off our packs, we went into town to have a look around. 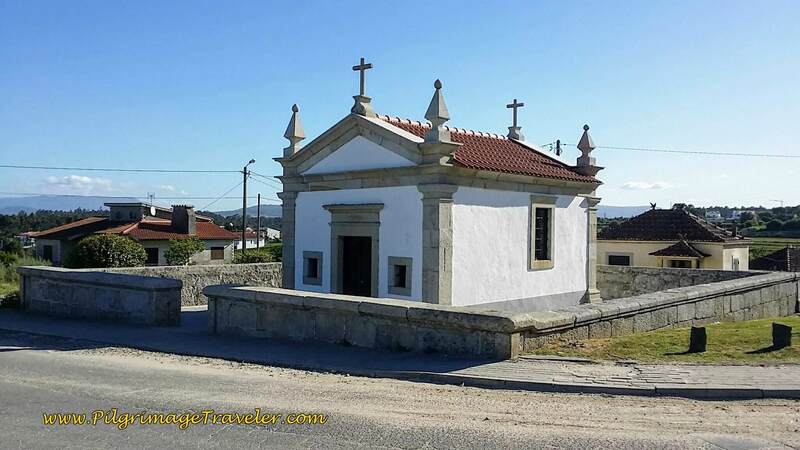 We stumbled upon the Capela das Almas, a lovely little historical chapel first built in the 13th century, with some evidence of uncovered Romanesque walls, perhaps from as long ago as the 9th century. 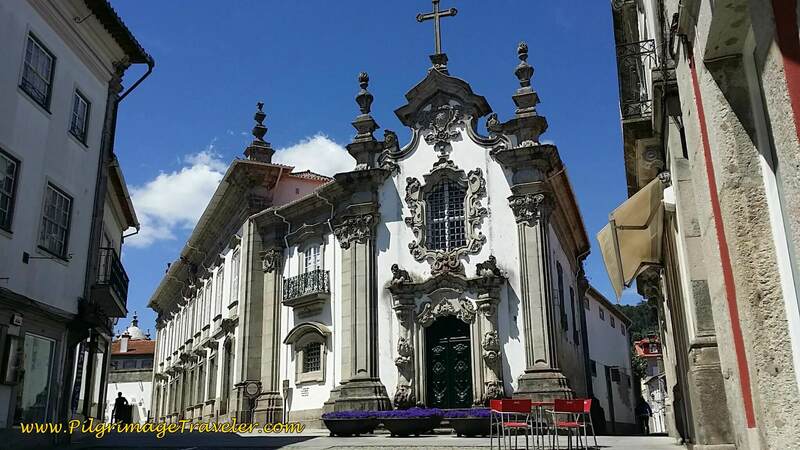 Then we turned northward toward this 18th century church, the Casa da Capela das Malheiras, with its flamboyant Baroque-style. It was closed when we sat by the café here to wait for our friend Steve and have a beer! We knew he was near and texted him to join us! 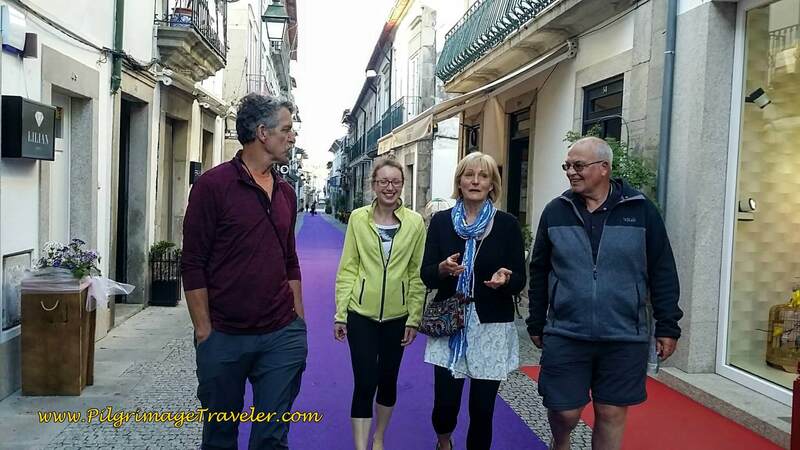 After hooking up with Steve, from the UK, and celebrating the day with a beer, we ran into Yanni from the Netherlands, and off we all went to the main square, the Praça da República. 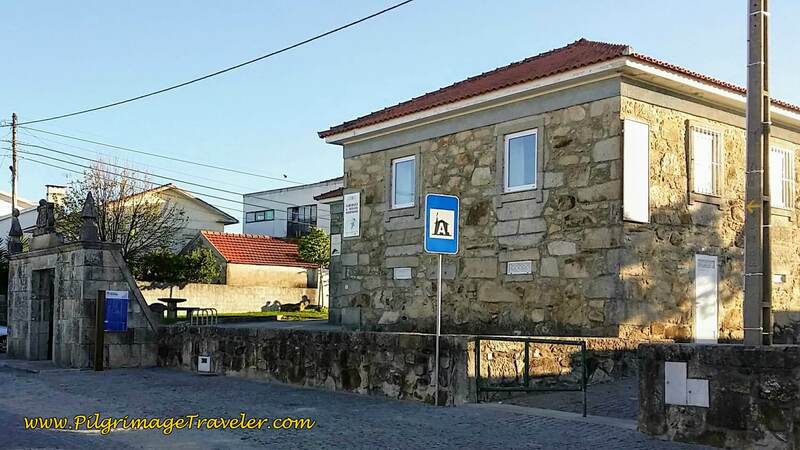 In the square there is this old edifice, below, the Antigos Paços do Concelho, the old town hall converted into an art gallery. 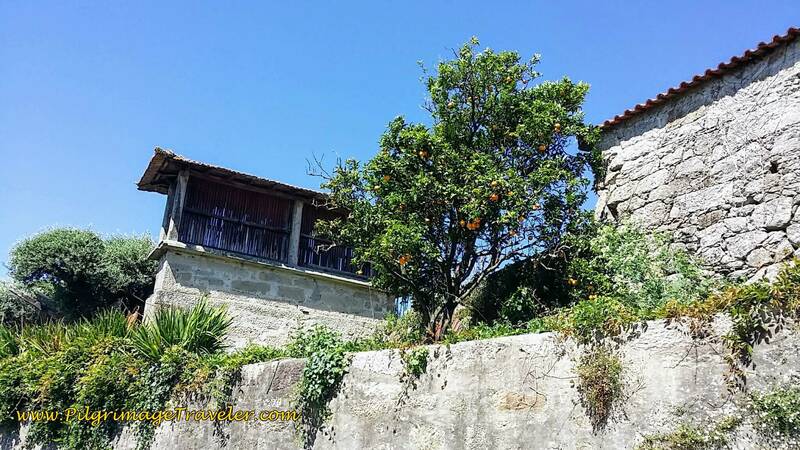 While I wanted to go see the Santuário de Santa Luzia, the prominent building on the hill behind Viana do Castelo, it was covered in scaffolding, so we opted not to try to see it. The views would be fantastic from atop the hill. I am saving it for the next time. 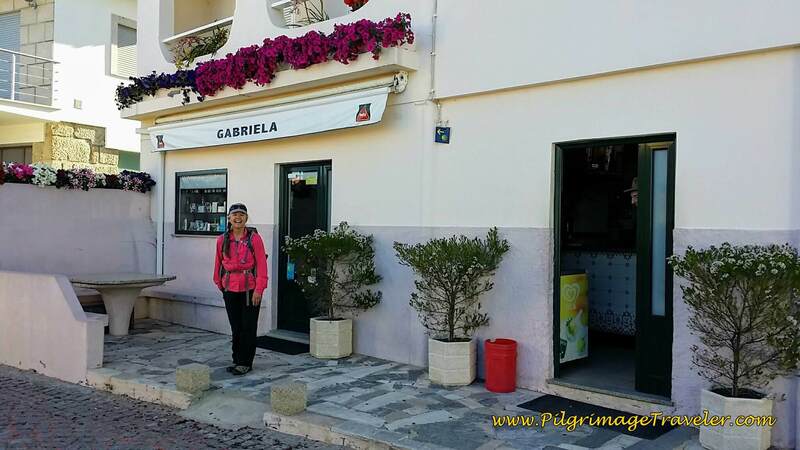 We rounded up our old and some new friends and went to a small restaurant for dinner together after checking into the albergue and exploring the town some more. We did return to the albergue at 1500 to line up for a bed. They round you up as you sign in at 1500 and a nice nun walks you outside and around the back to the albergue. Despite what your information says, there is NO kitchen here. Just a microwave, hot plate and a few bowls and cups. This was April 2017. A group of us, hungry for a meal we could prepare for ourselves had bought chicken breasts, pasta, bread and veggies in town before 1500, only to end up donating what we couldn't take with us to the nuns, when we learned there was no kitchen! Needless to say, the nuns appreciated our mistake very much! This was not one of our favorite albergues. There were only two, very small, unisex bathrooms with precisely 2 showers, 2 toilets and 2 sinks. I don't enjoy unisex bathrooms much! Especially one as tiny as this one! There are 2 bunk rooms one with 8 beds, one with 10 beds. Everything was so tight and so small. It was a miserable night here for me, perhaps I got 5-6 hours sleep, tops. If I knew this, we would most certainly have chosen a family hotel. 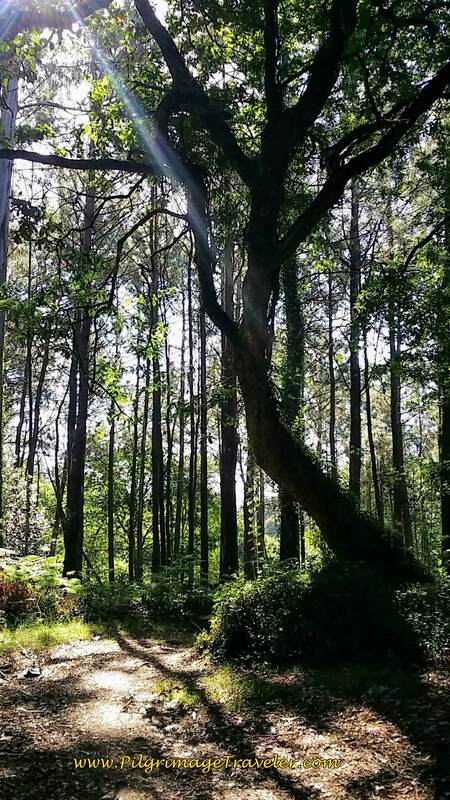 If you wish to reserve better accommodation, here is a link to Viana do Castelo hotels. However, with all bad comes good and we met lots of new friends. Tatiana, a Dr from the Czech Republic, Yanni from the Netherlands, again, and we got to know the Frenchman, Michele, and Steve the Britt much better. 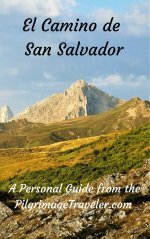 It was also serendiptous for our next day, day eighteen, as we got very useful information on the Senda Litoral that we would never have known, had we not talked to the hospitilero here at the Convent. Our day seventeen was filled with the simplicity, discovery and adventure that Elizabeth Von Armin refers to in the beginning quote. 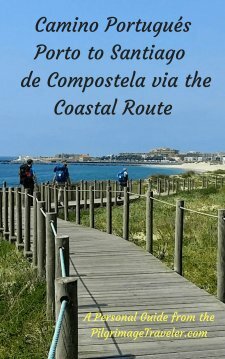 Thus far, our personal adventure, though different on the Caminho Portugués da Costa, in comparison to the Camino from Lisbon to Porto, it was still fulfilling in its own unique way. We were making new friends, yet continuing on at our own rhythm. 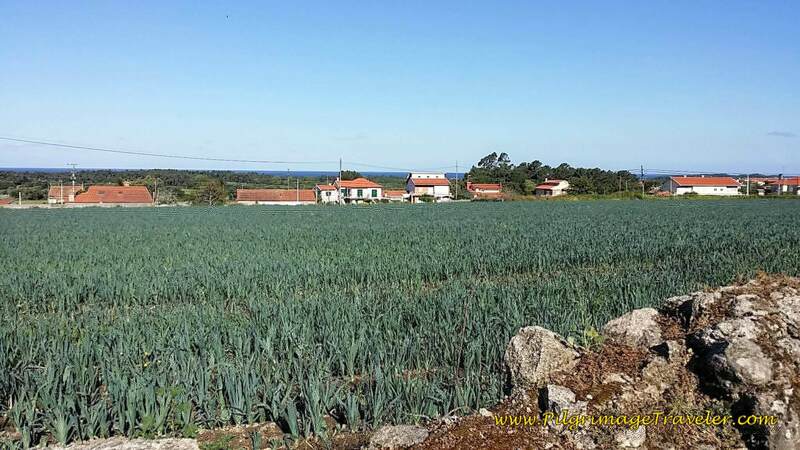 I missed the coast on day seventeen of the Caminho Portugués da Costa, yet I knew that there was much more to come on day eighteen! 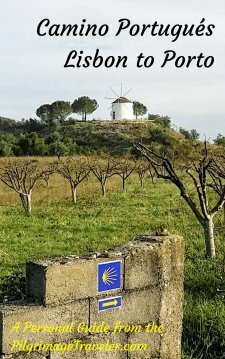 May your own day seventeen on the Caminho Portugués da Costa, be filled with no worries of everyday life and be filled with simplicity, adventure and discovery!